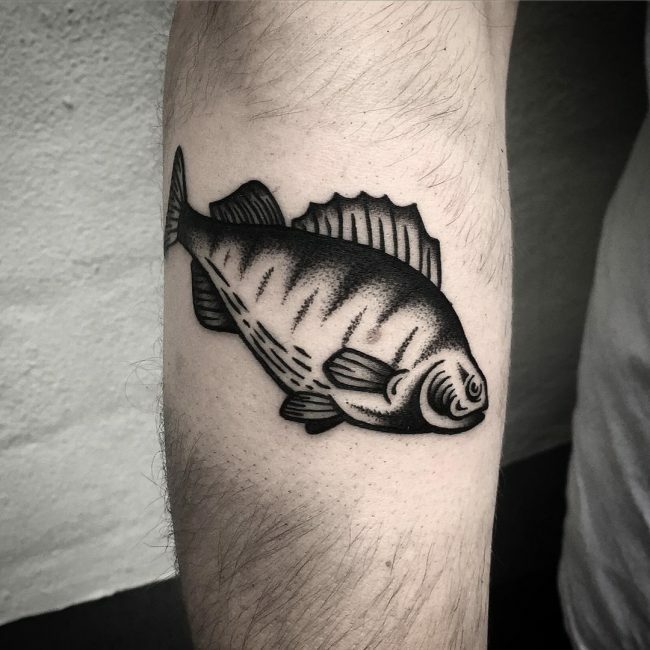 People have been drawing the fish tattoo for centuries, and it is one of the oldest types of body markings. 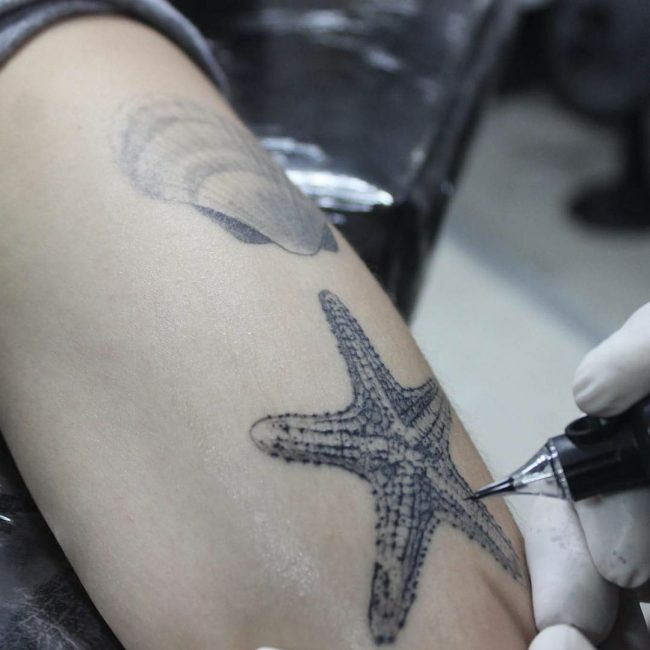 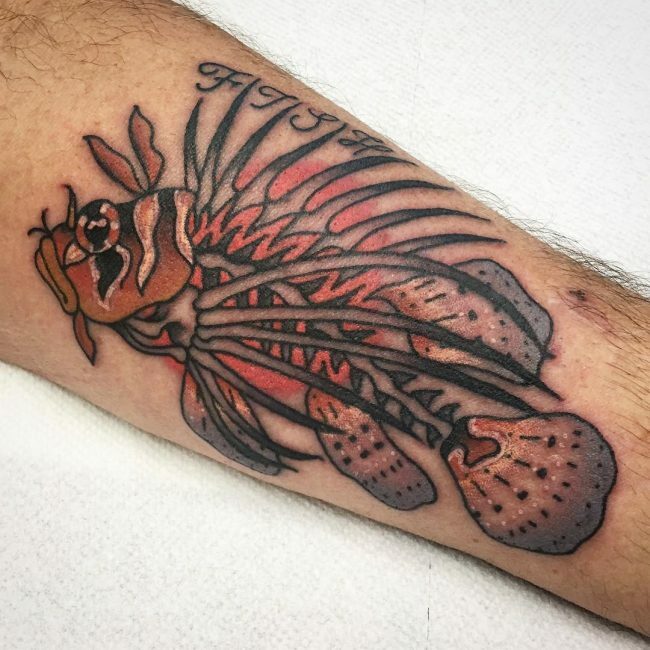 There are thousands of fish species in the oceans and rivers, and so you can always be confident that there is something unique that you can have for your tattoo. 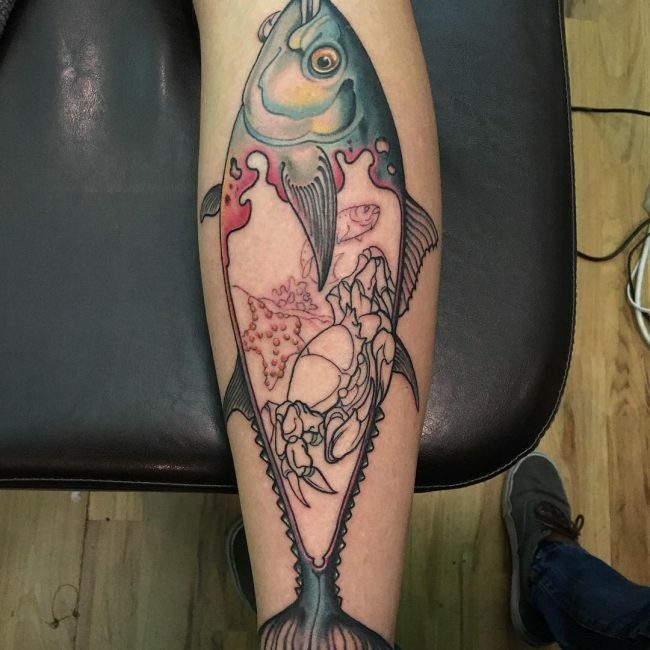 The sea is one of the earliest sources of food for humanity, and so together with all its creatures it forms an important part of human history. 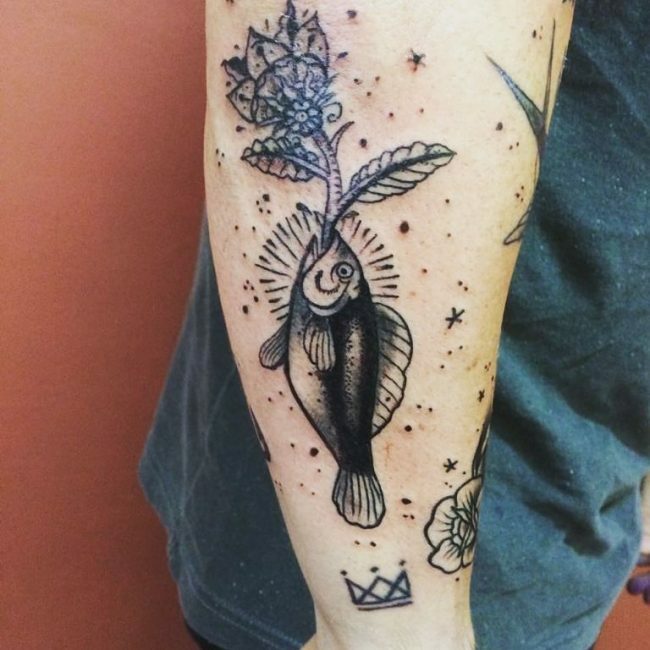 And so having the tattoo of a fish anywhere on your body is very symbolic. 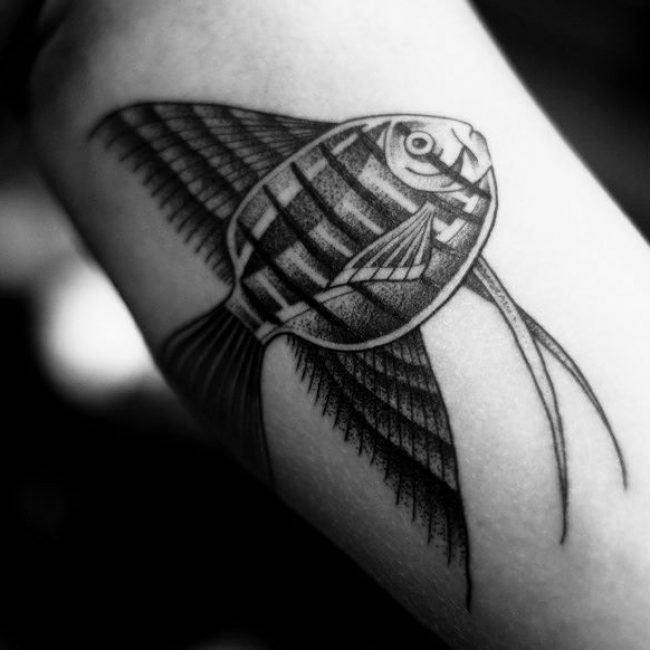 Apart from its symbolism, a fish is also a beautiful creature that will give you an adorable body art. 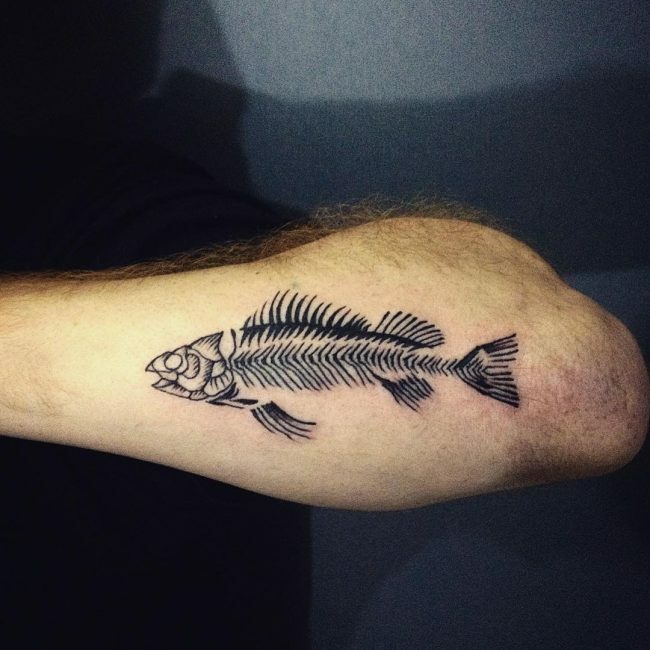 Human beings have been fishing for millions of years and anthropologists believe that people were eating fish from the very first stages of evolution. 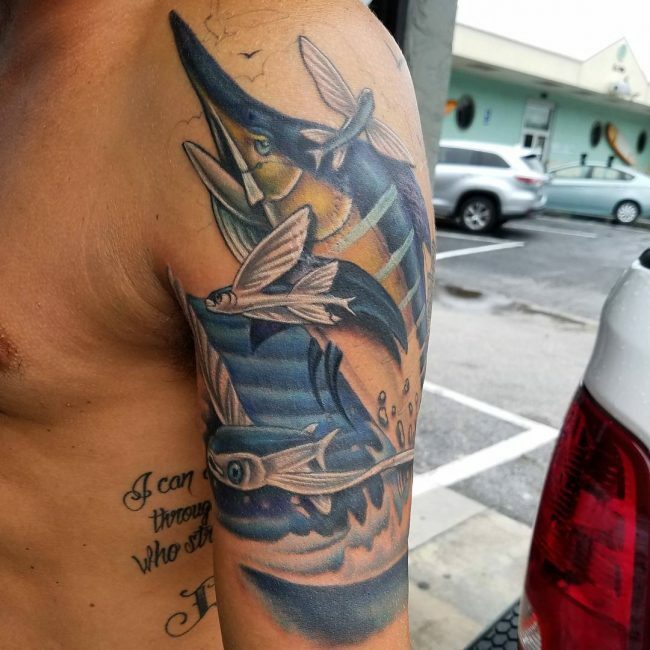 As humanity evolved to a more intelligent creature, he would paint the images of the animals that provided him with sustenance and fish was among these animals. 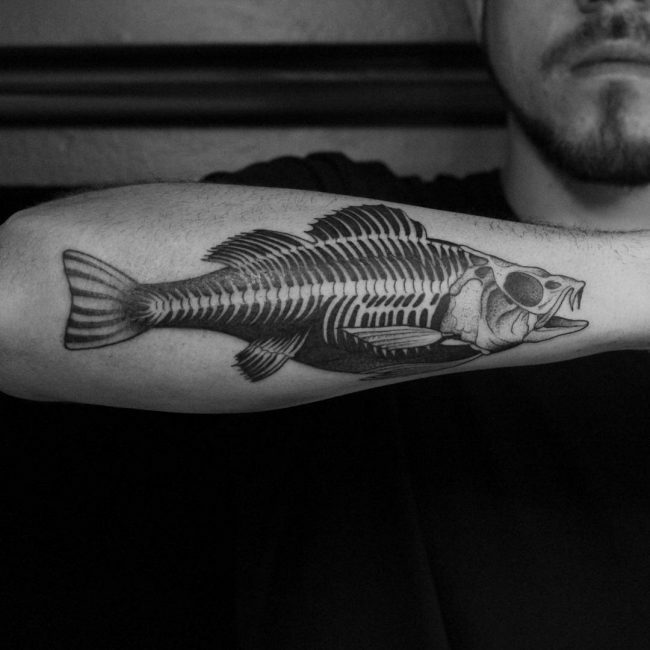 In fact, fish drawings are among the oldest to be discovered to date. 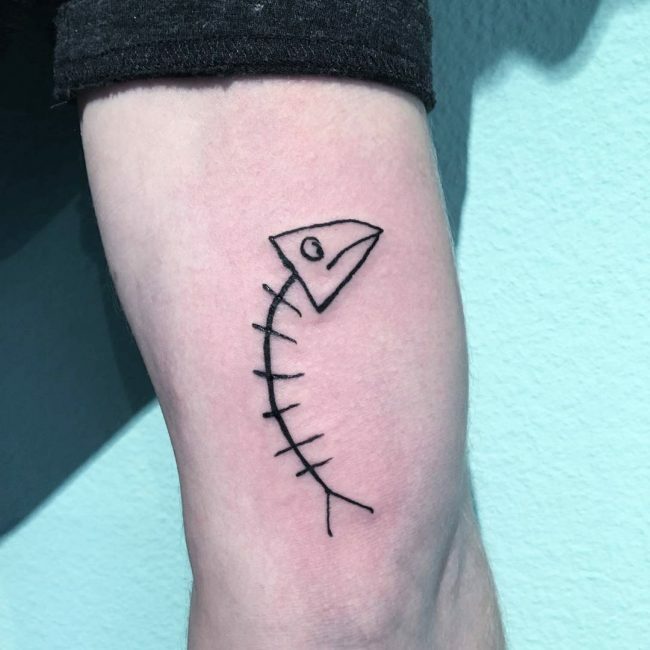 But, for a tattoo or body marking, it is quite new because historical evidence shows that fishers were the first people to get this type of symbol. 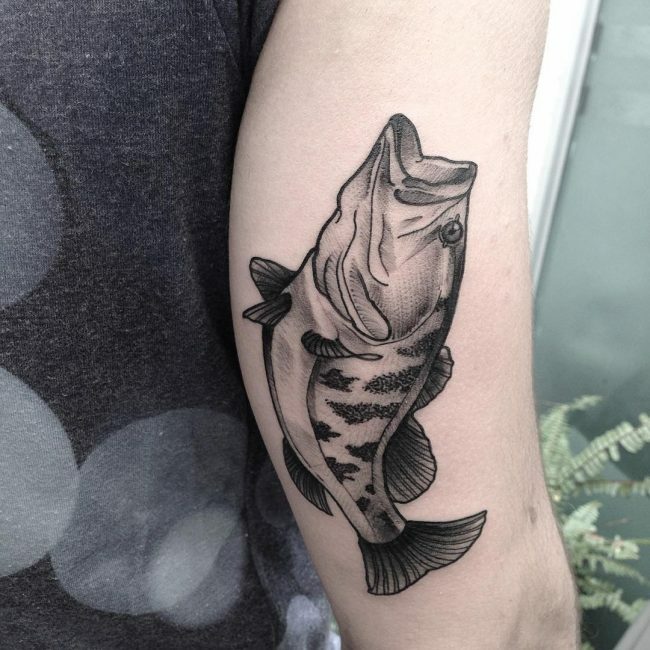 Christian faith out it the open and so the believers of that time would draw a fish tattoo on their body which they would use as their identity. 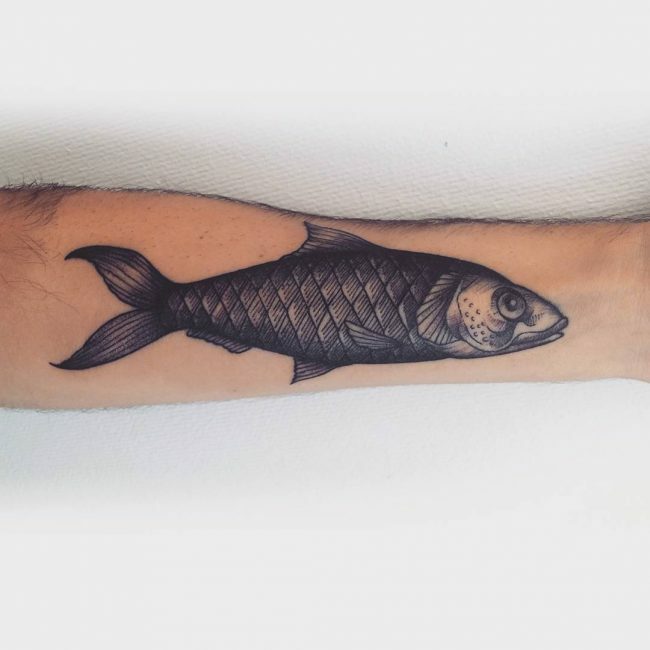 The Fish also forms an important part of the religion because Jesus was the “fisher of men.” Even after the persecution era Christians would still have a fish as a symbol of their faith and this practice continues to date. 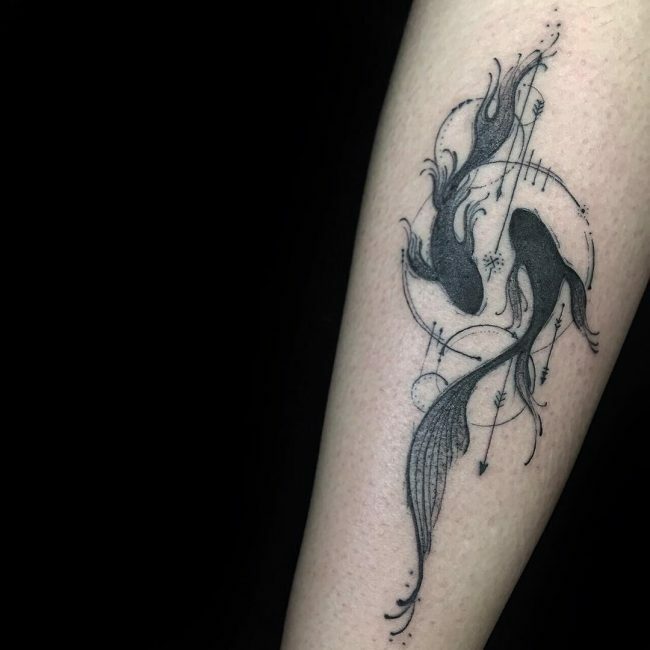 This tattoo also has some origin in African and Asian cultures where it was a symbol of transformation, fertility, and creation. 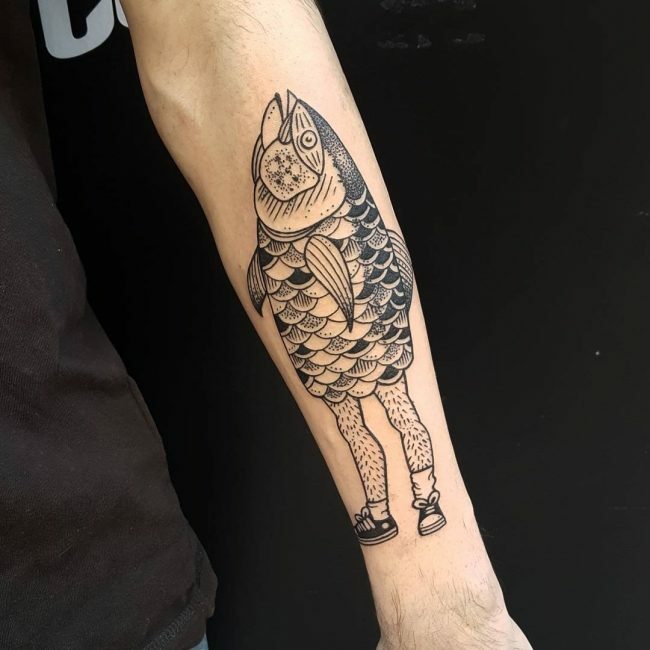 For example, the Hindus believe that one of their gods, Vishnu transformed into a fish so as to save the world from a raging flood. 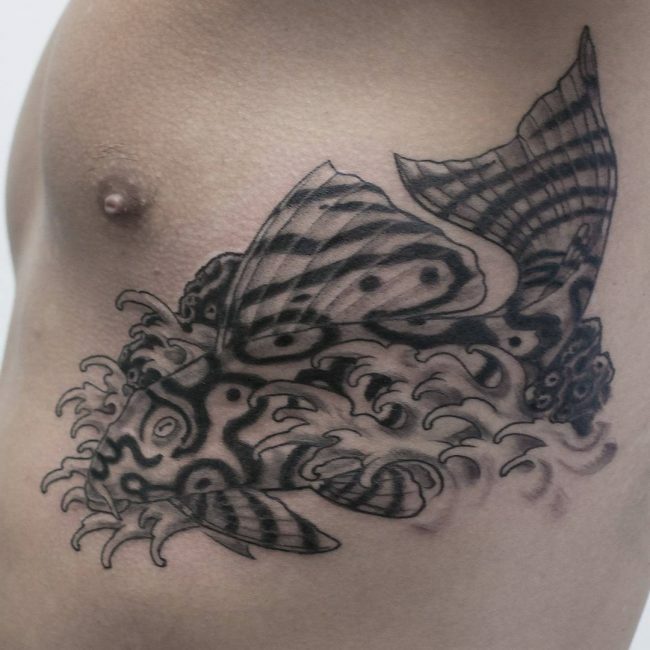 In these cultures, the fish was an important animal. 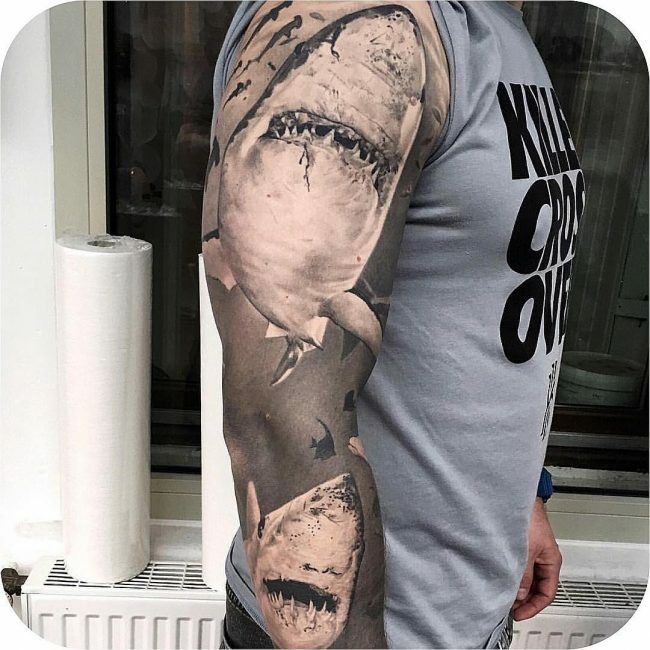 To show this, people would make carvings and paintings of these creatures. 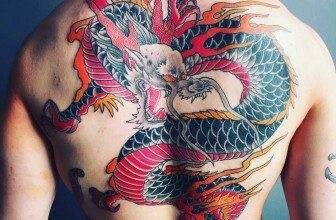 It was also a great honor to draw it on your body and in some traditions it was a way of protecting yourself from evil. 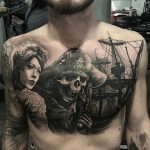 However, most of the modern designs originate from seafarers, but their distinct and innovative designs are a result of the ever increasing creativity of body art artists and enthusiasts. 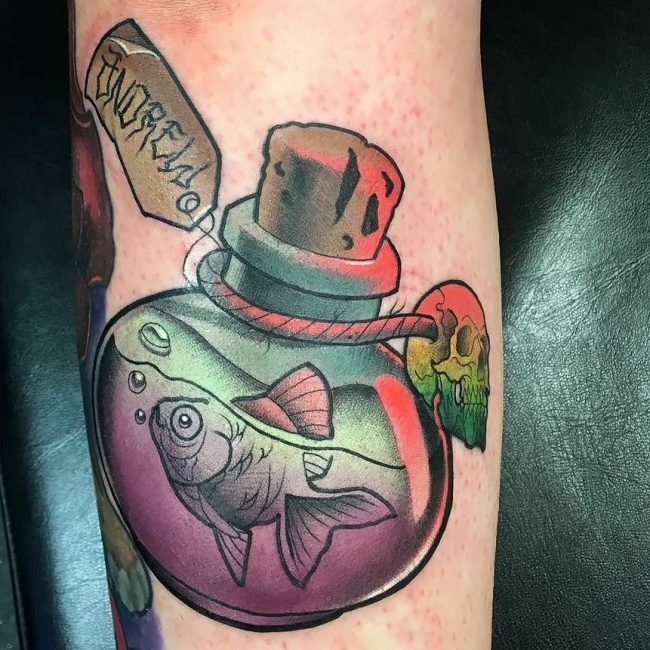 There are almost endless things that you can associate with the fish totem and just like with any other totem the meaning will depend on you. 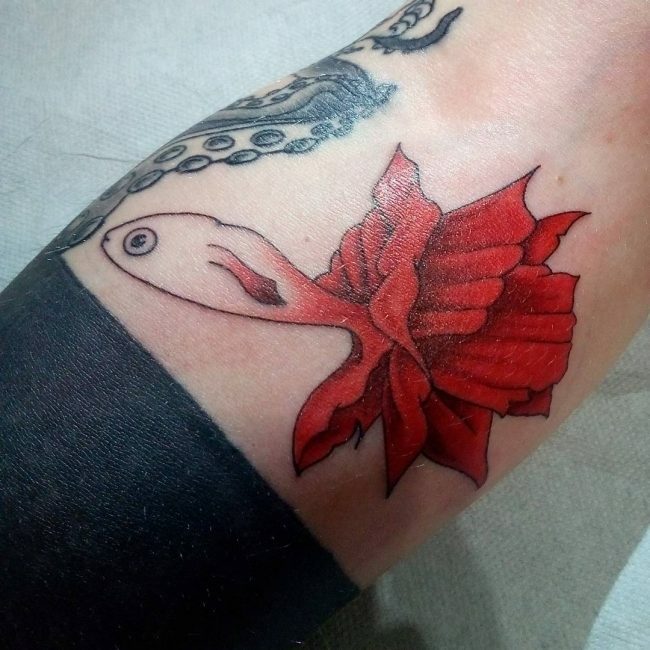 For example, Christians will draw a fish as a symbol of their religion or show solidarity with the early Christians who went through persecution due to their faith. 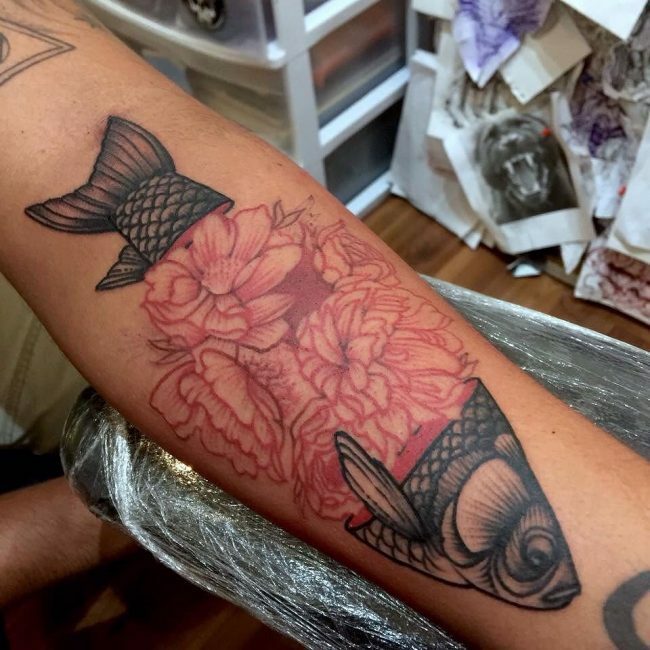 In Christianity, it is also a symbol of abundance, and this comes from the fishes and loaves story in the Bible. 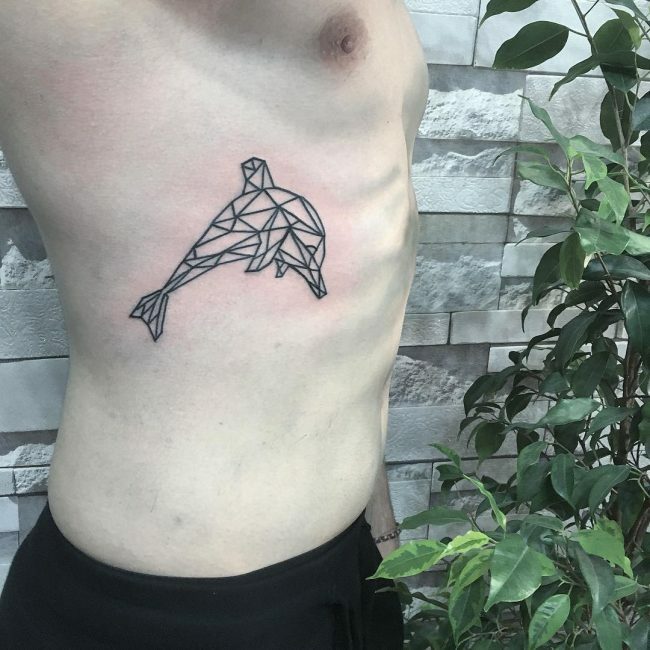 If you believe in Greco-Roman mythology, your body marking can also mean transformation and change because this is what this sacred creature would symbolize in these cultures. 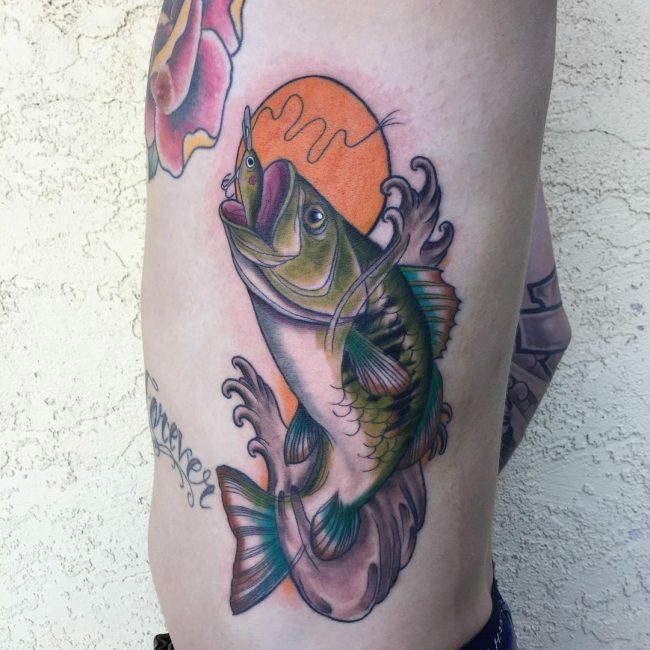 In some ancient pagan traditions, the fish was a symbol of femininity and fertility or an attribute of aimportant goddess. 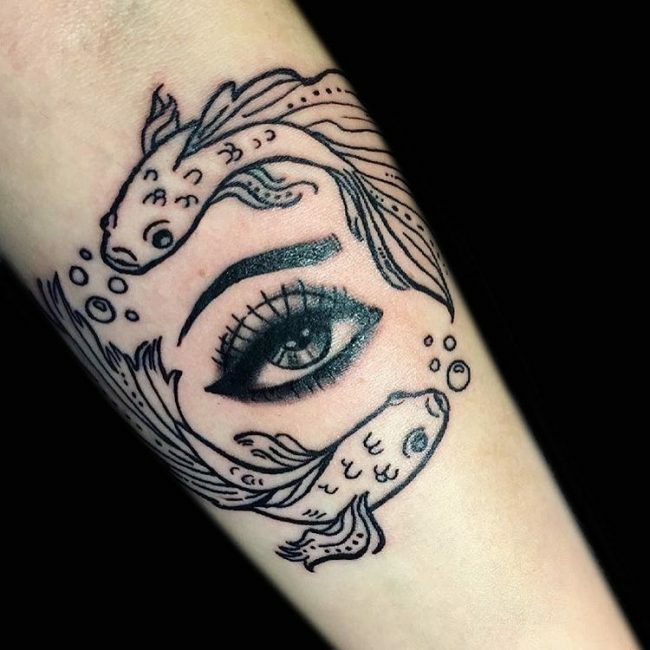 For pagans, all the creatures of the sea are aspects of the female deity and fertility. 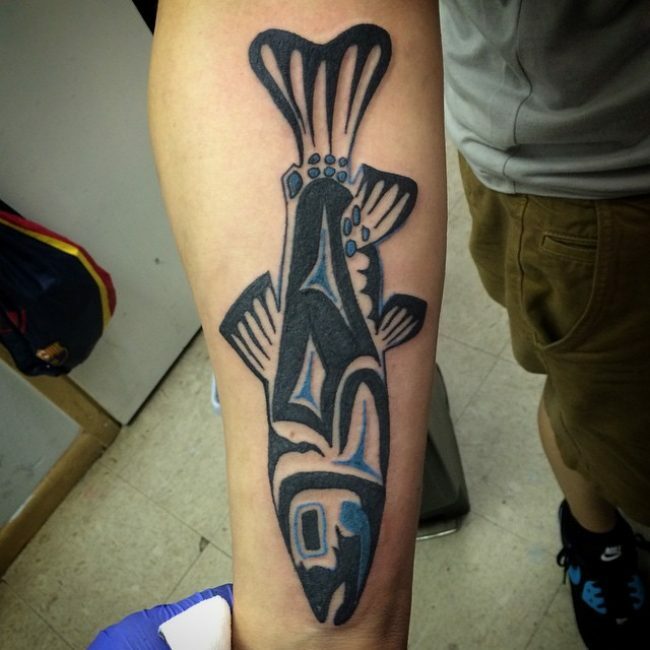 The fish totem can also symbolize prophecy, inspiration, and wisdom. 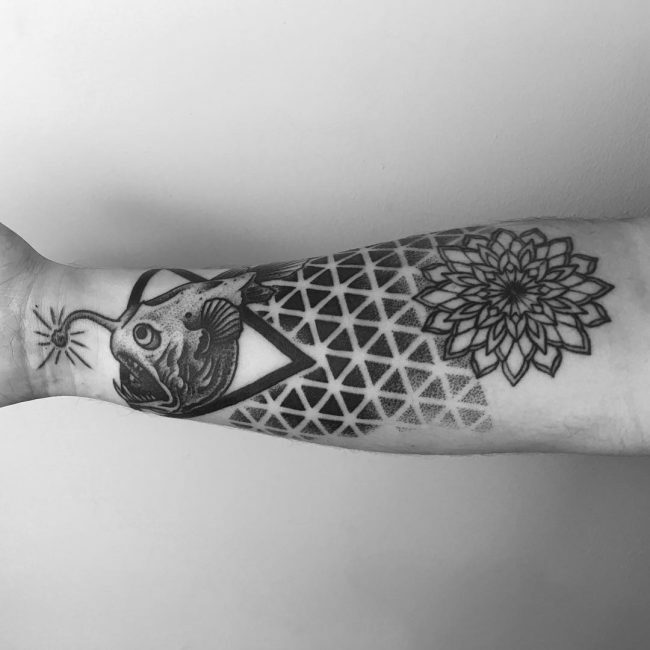 This meaning comes from an ancient Celtic belief. 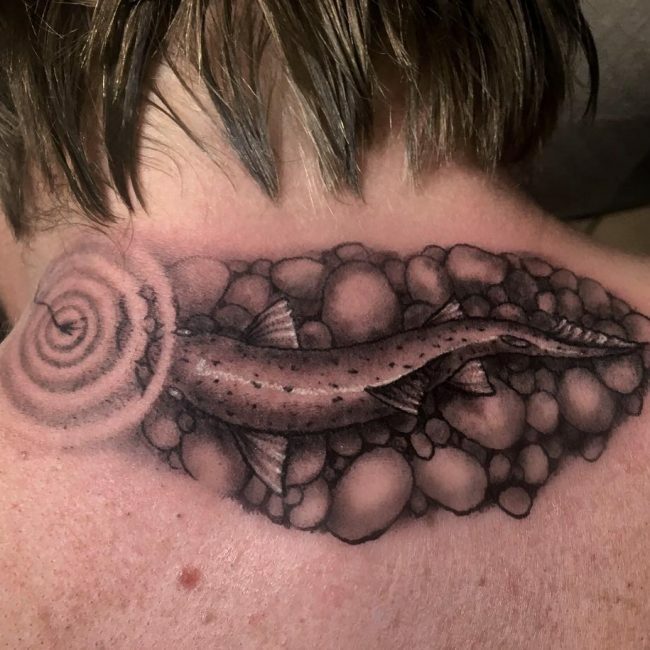 According to the Celts, the fish (salmon to be more particular) was an intelligent creature, and its wisdom comes from eating the sacred hazelnuts from the well of knowledge. 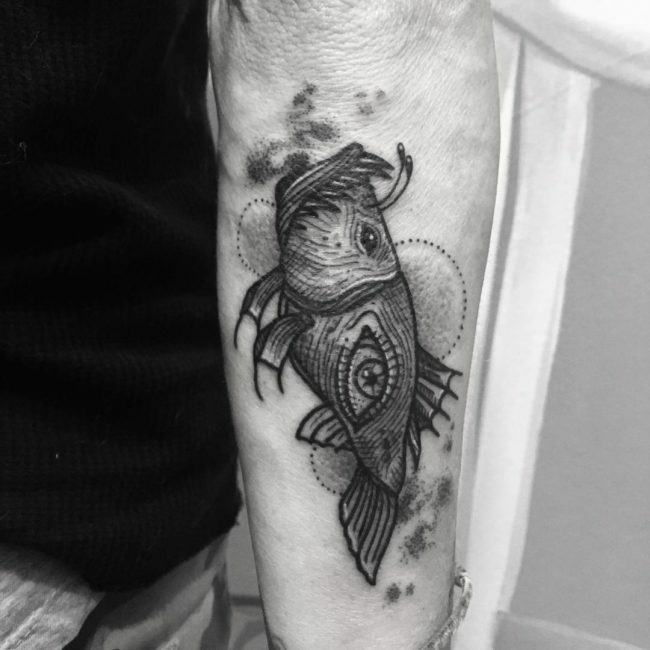 The fish totem can also symbolize fidelity and unity. 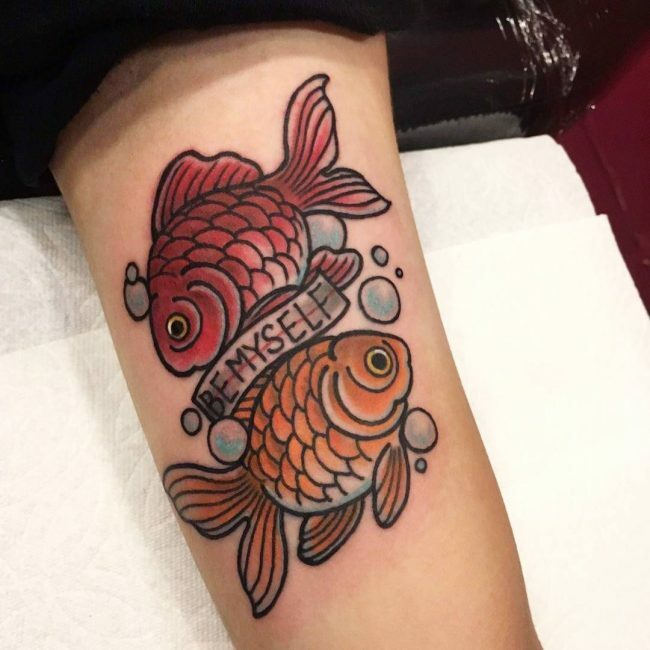 This meaning comes from the Chinese culture because one of their most sacred types of fish, the koi, always swims with a partner. 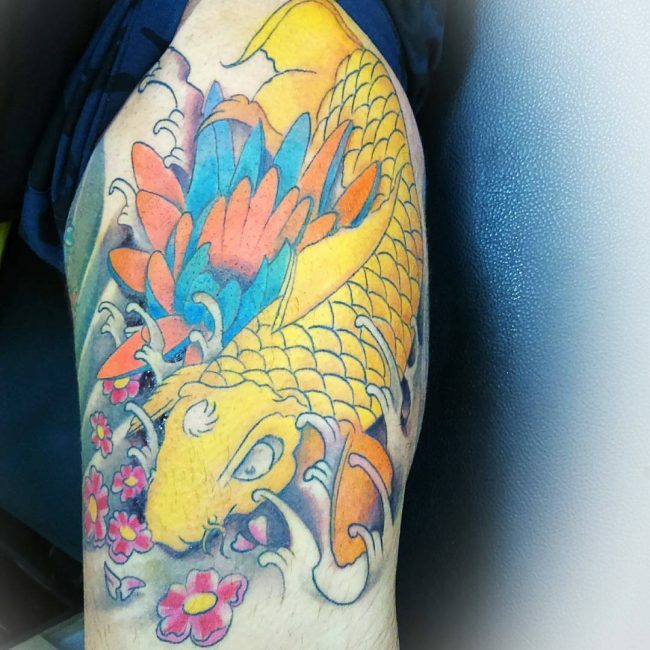 It is because of this reason that you will find people giving a koi pair as a wedding gift to symbolize the unity and fidelity of the newlyweds. 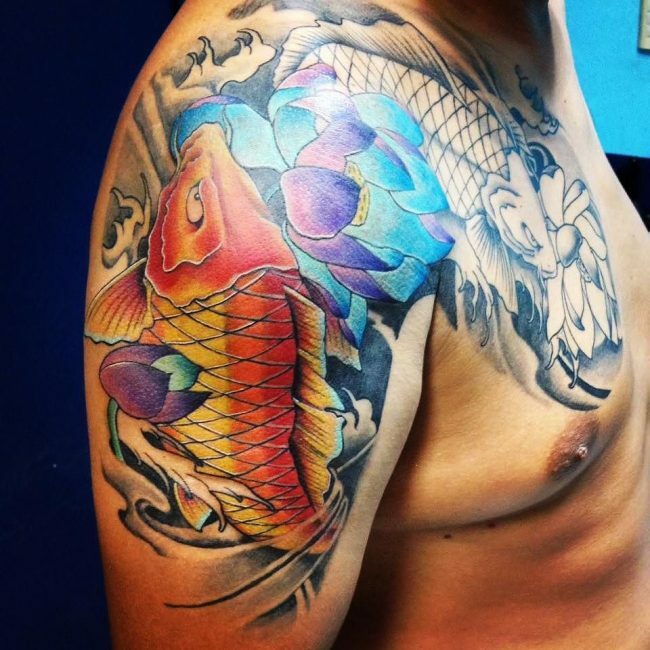 In most Asian cultures the fish also represents abundance and fertility because it can produce fast and in a high volume. 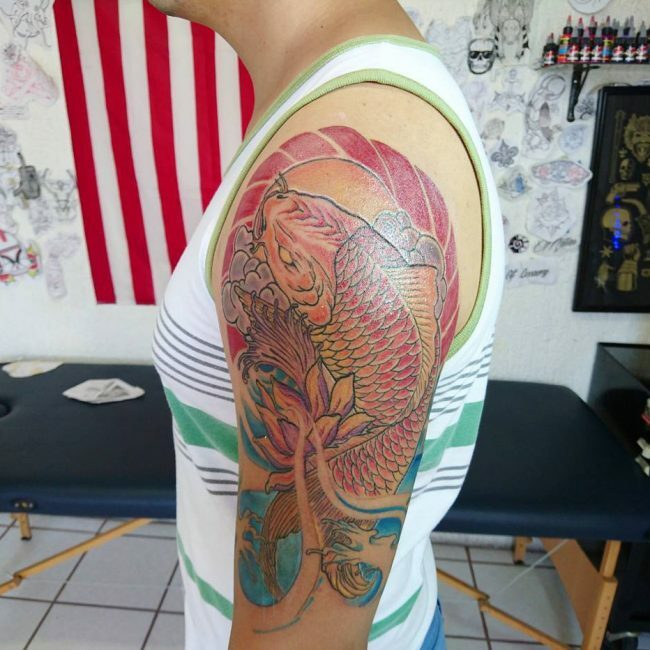 Also, in Buddhism, it is a symbol of freedom and happiness and it is also one of the eight sacred symbols of the religion. 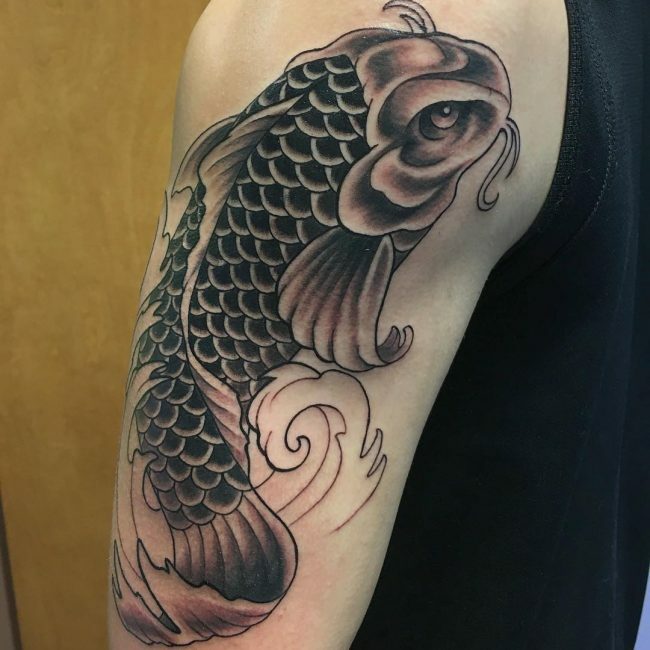 The other meanings that people associate with this tattoo include good luck, happiness, knowledge, strength, and ambition. 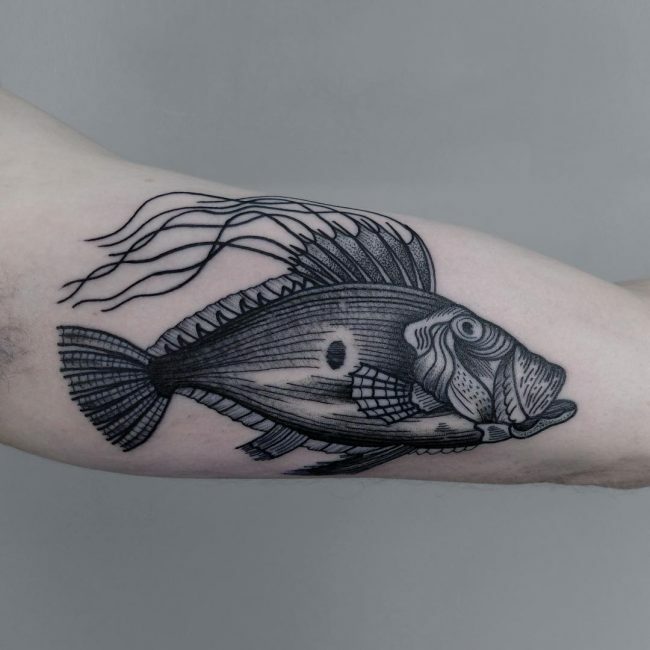 There are thousands of fish species in the oceans and rivers, and more are yet to be discovered meaning that you will never run out of ideas when it comes to the fish tattoo. 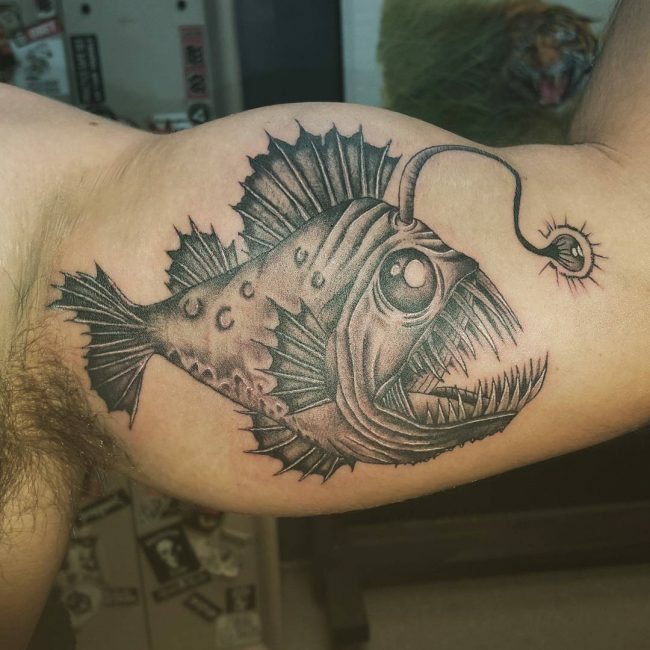 Whether you want to draw a simple fish design or something realistic and detailed, there are still many options available. 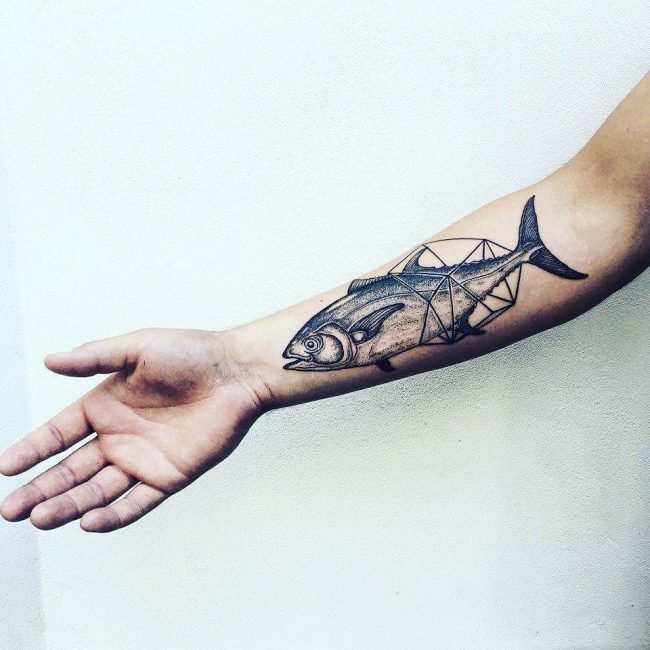 Here are some of the most famous designs that you can try out. 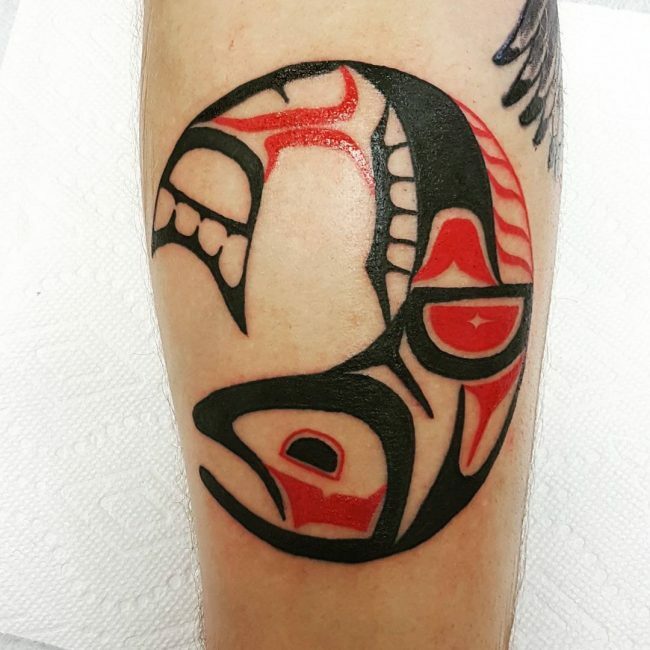 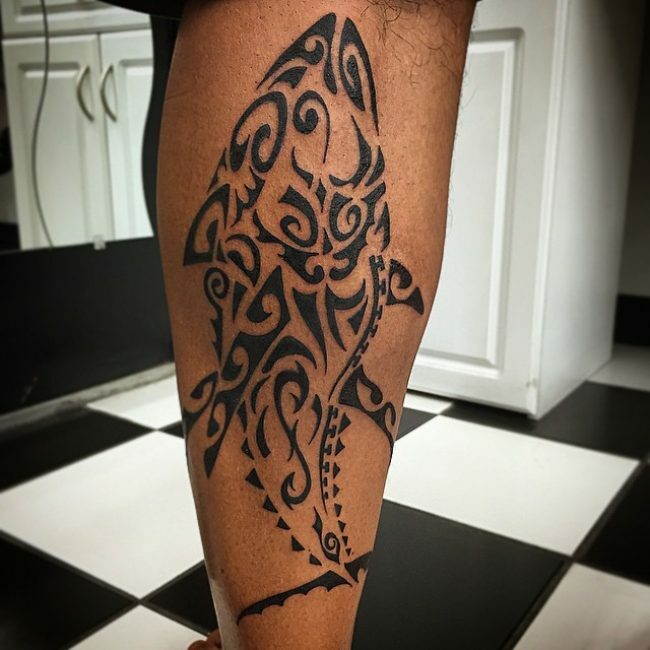 The Tribal fish design is ideal for the enthusiasts that like spicing up their body markings or having images that are unique and trendy. 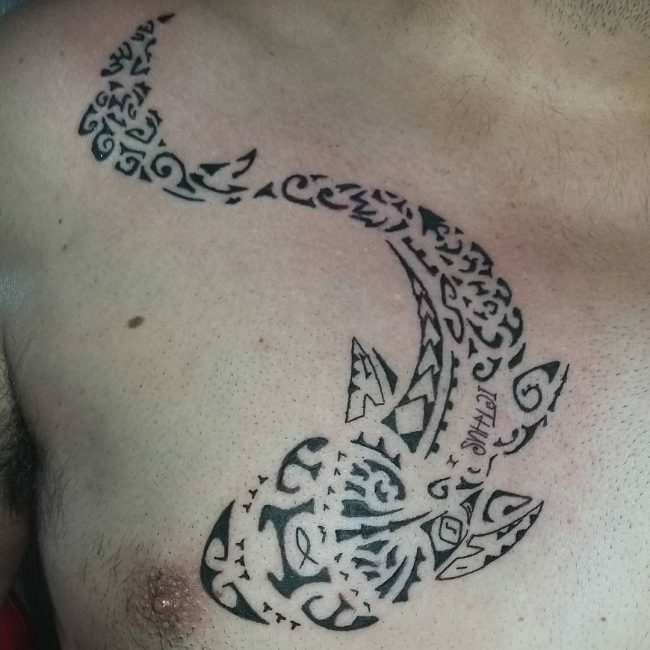 It entails drawing a simple fish design in black ink and then enhancing its appearance with some beautiful tribal patterns. 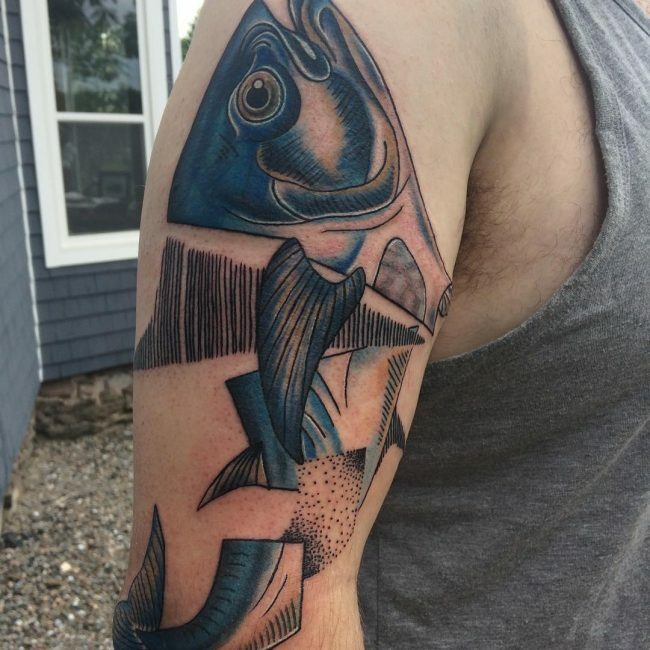 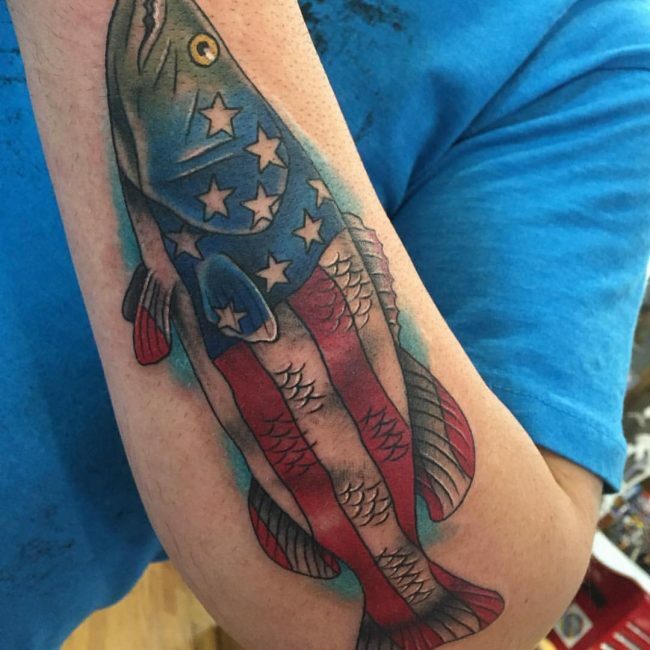 You can use any fish that you want for this tattoo but make sure that you only use an artist that knows how to draw these patterns. 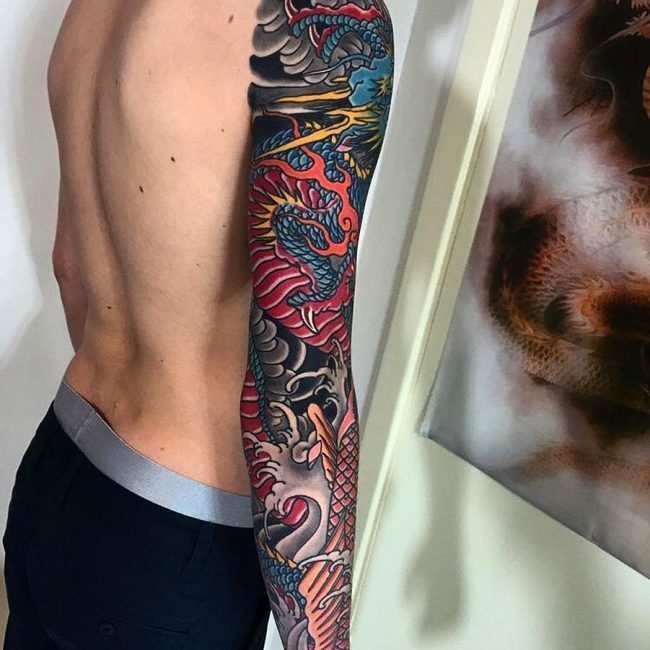 Modern technologies give artists impressive abilities, and one of the most exciting ones is being able to express body art in 3D. 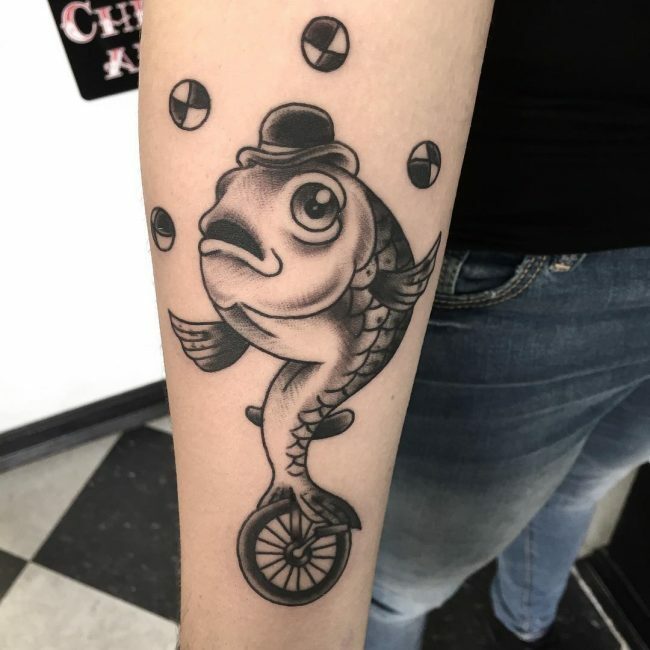 If you want a realistic and stylish looking fish totem, you should have one in 3D. 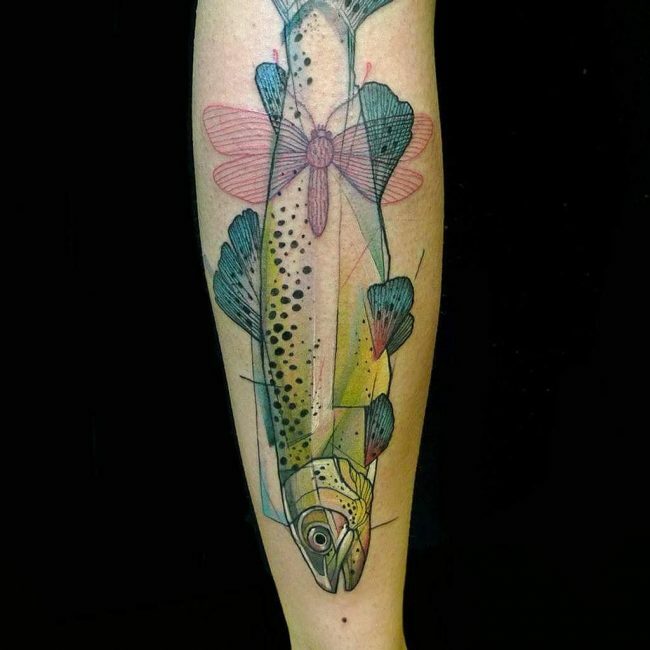 3D tattoos have been around for many years, and they keep getting better, and so drawing your fish sleeve or a simple wrist tattoo using this technique will always give you an adorable image that you will want to show off. 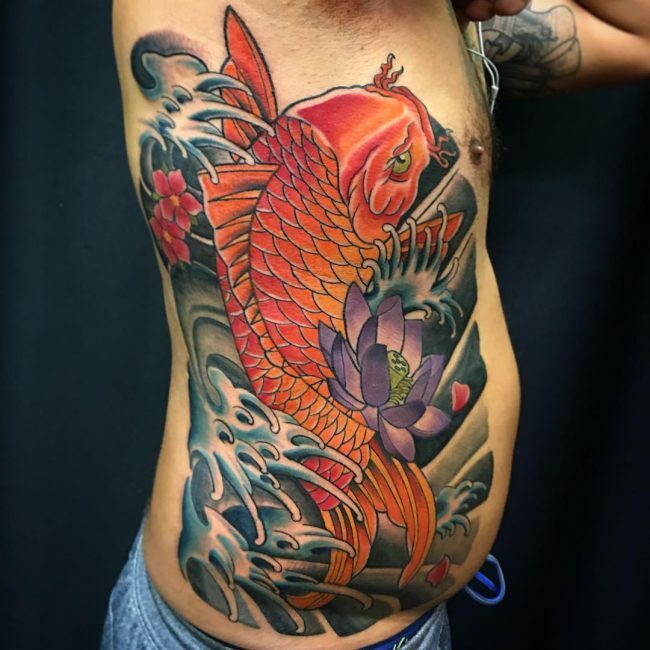 The picture of the beautiful koi fish swimming in a pond is famous around the world and although most people associate it with the Japanese cultures it has its origins in China. 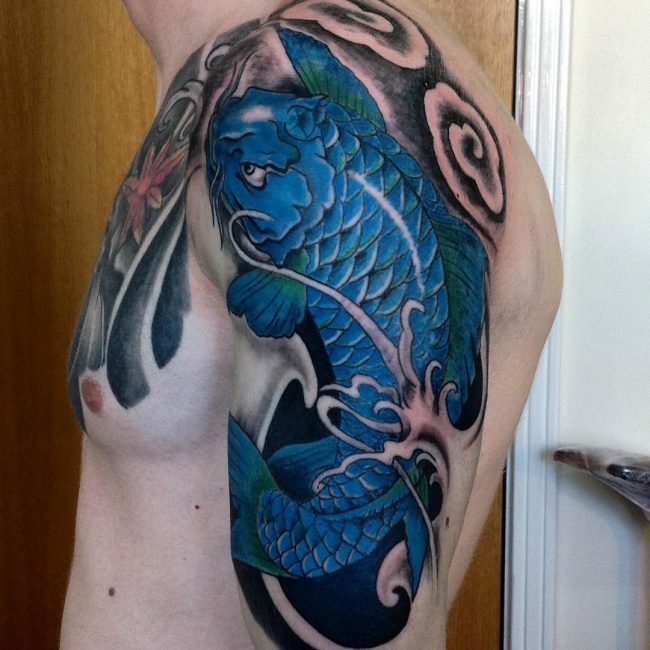 And so if you are thinking of drawing a stylish and symbolic fish tattoo the koi is an excellent choice. 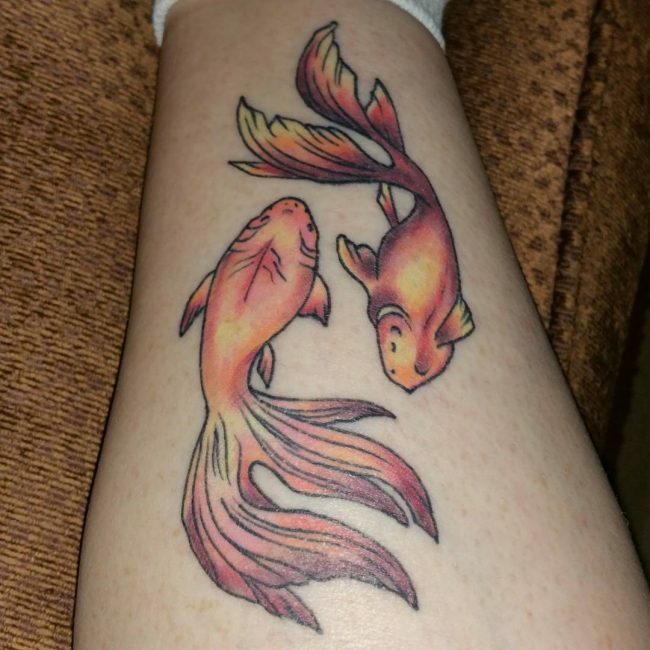 The best thing about it is that it is a very colorful fish and so you have the opportunity to use color on your body markings. 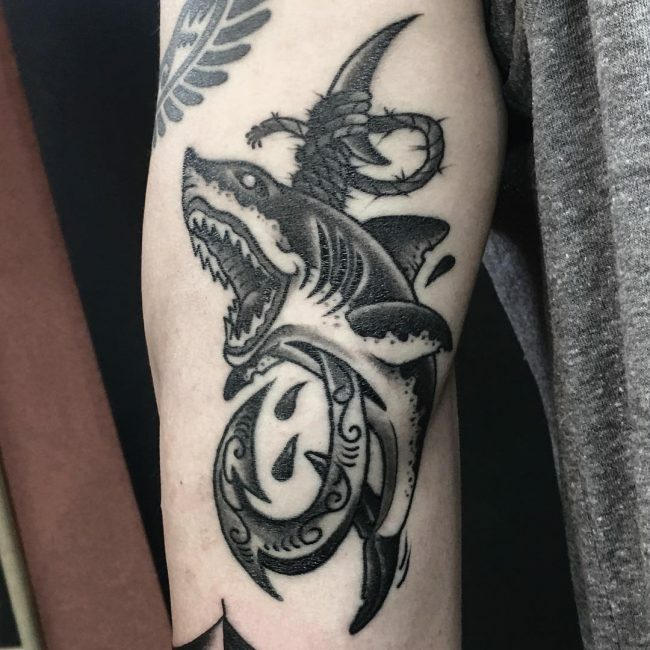 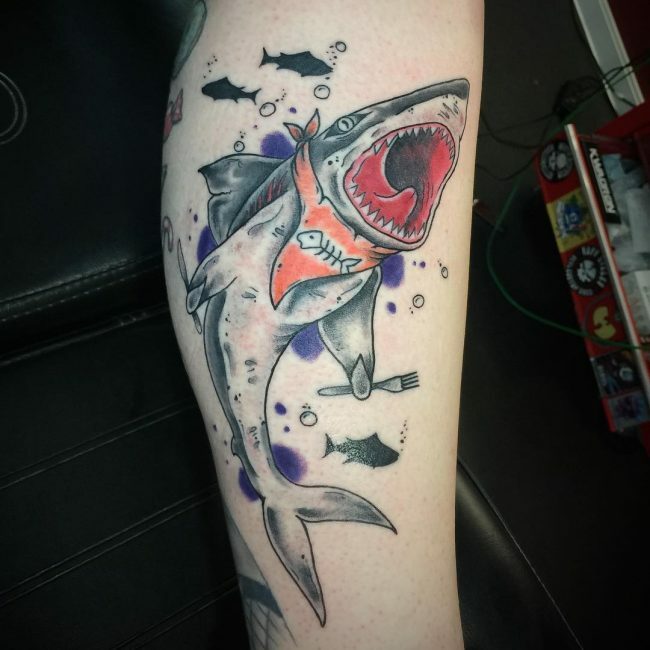 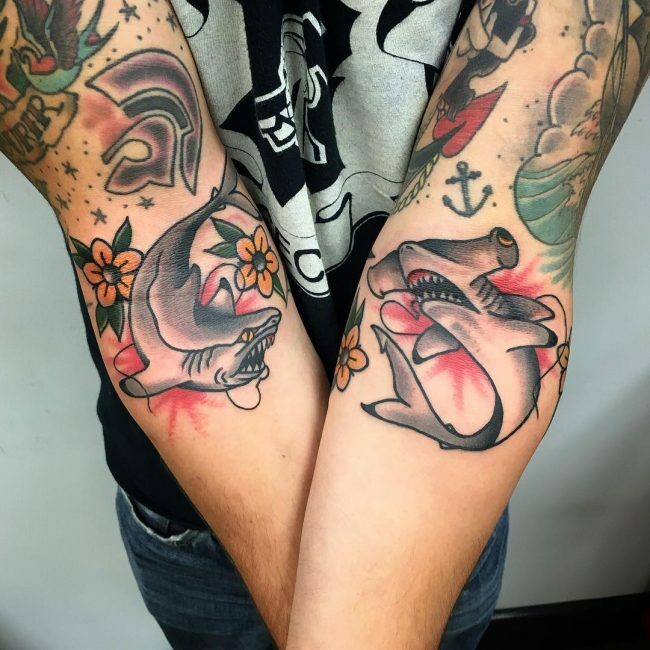 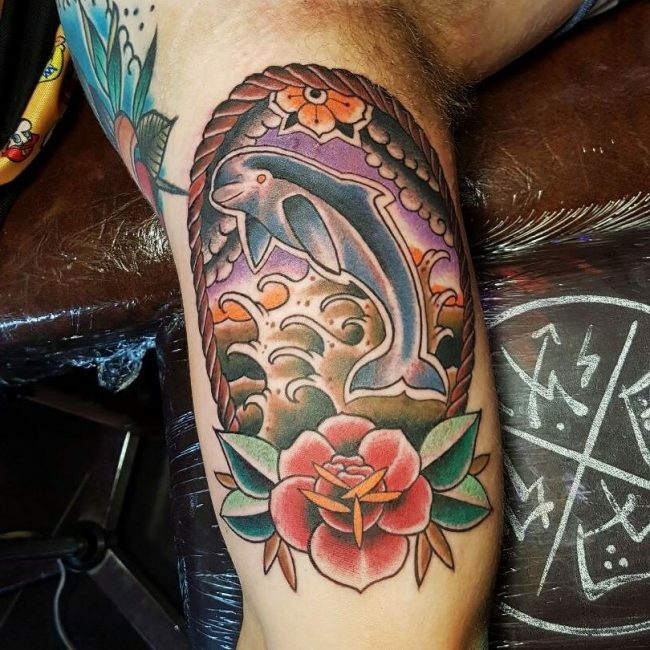 Dolphins and sharks are also fish and so you can also draw them for this genre of tattoos. 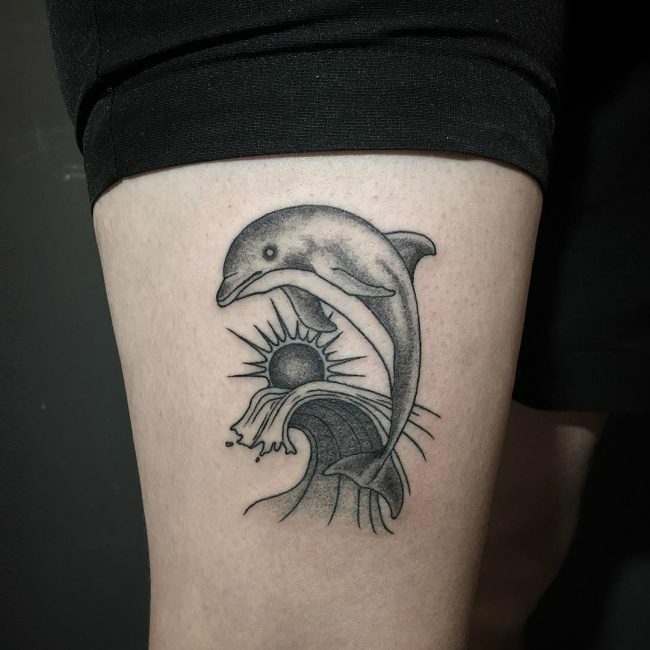 The Dolphin is a remarkable mammal, and it is also an intelligent creature. 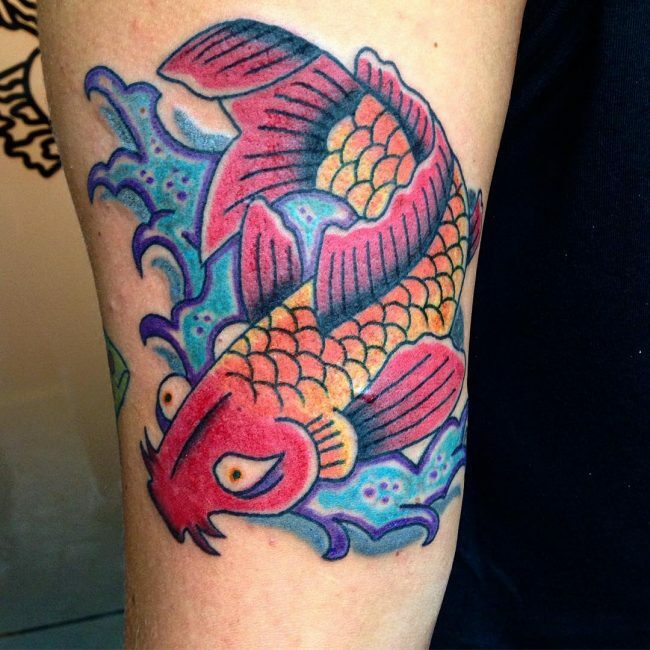 But, it also has a beautiful appearance and colors that make it a perfect tattoo element. 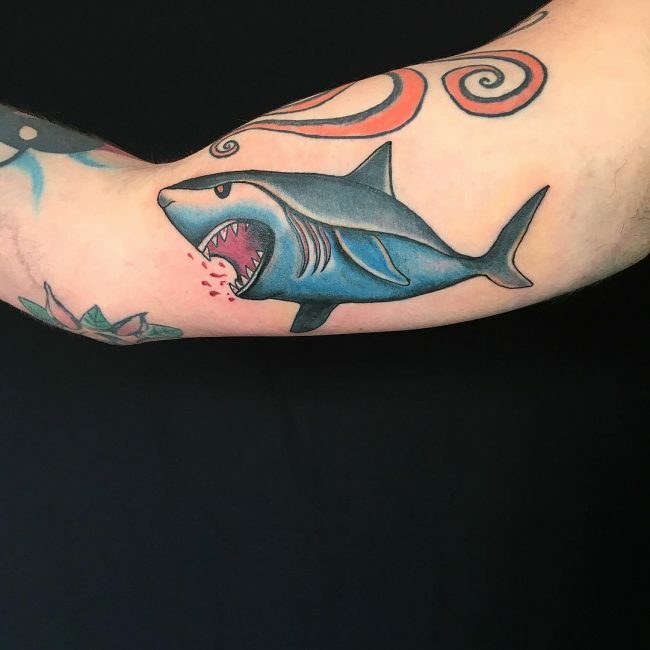 The shark, on the other hand, is a fierce predator that strikes terror in the hearts of people, but it is also a beautiful and mysterious sea creature. 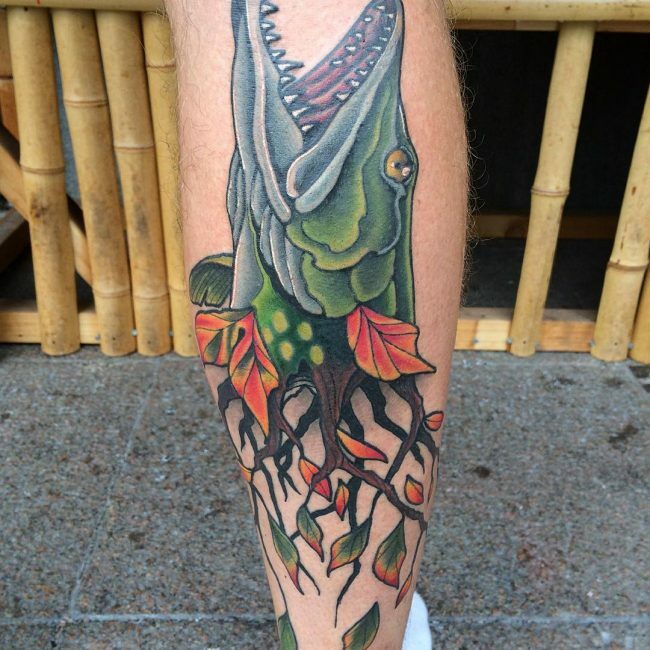 Fishing for sport or food forms the livelihood of thousands of people across the world. 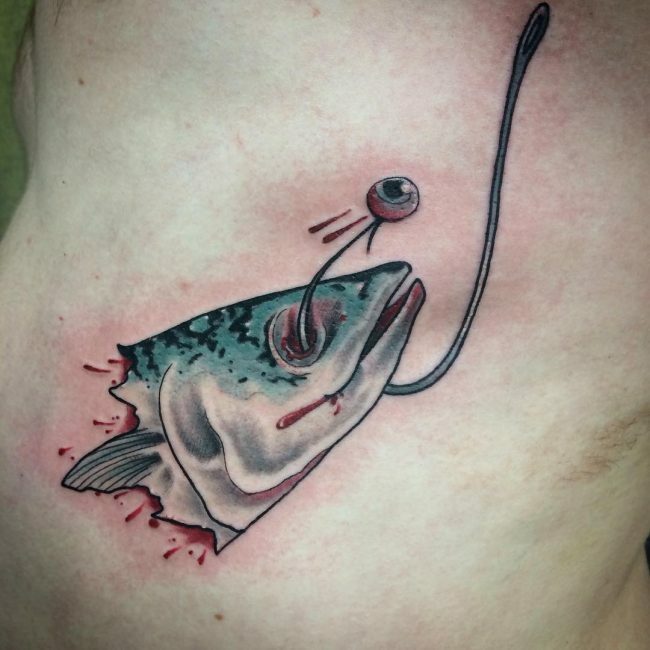 However, a fish on a hook tattoo has more symbolism than this. 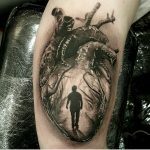 It can mean that you have conquered something in life such as an addiction or you have achieved a dream. 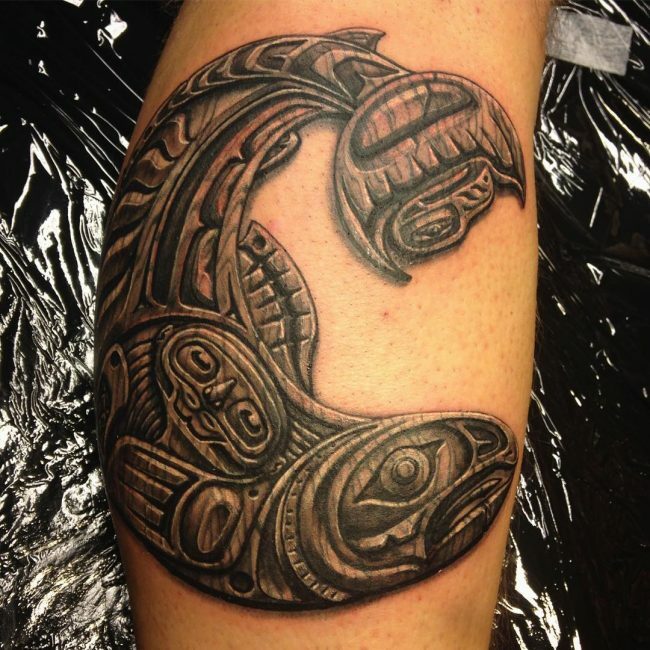 The hook also has many other meanings and so combining it with a fish will make your totem very symbolic. 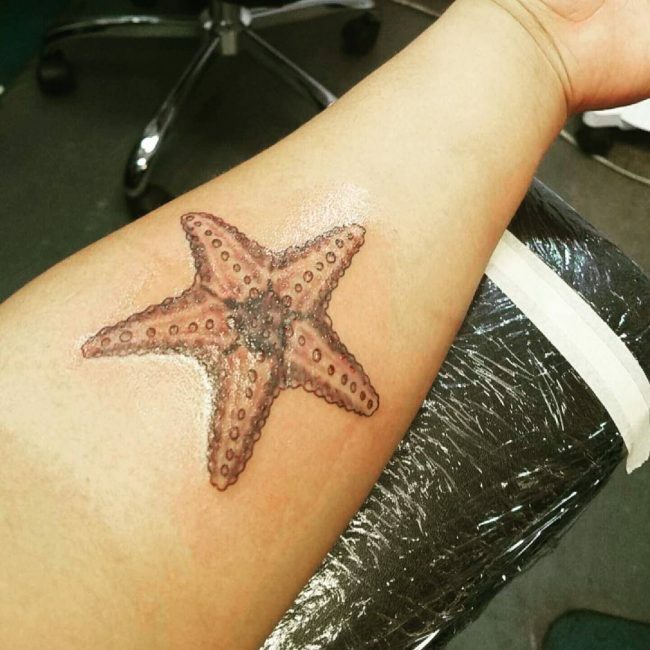 The starfish is a unique kind of fish because of its appearance and character. 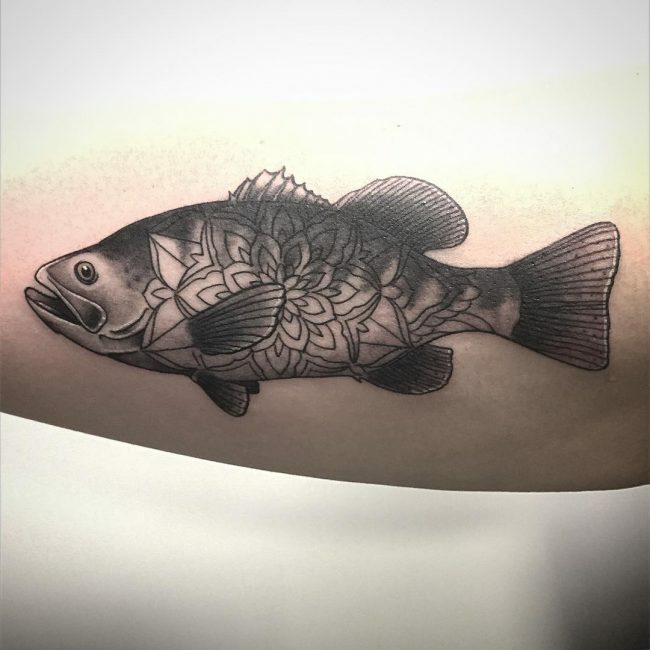 This fish is easy to draw because you only need to get the shape right and this is what makes it an attractive tattoo option. 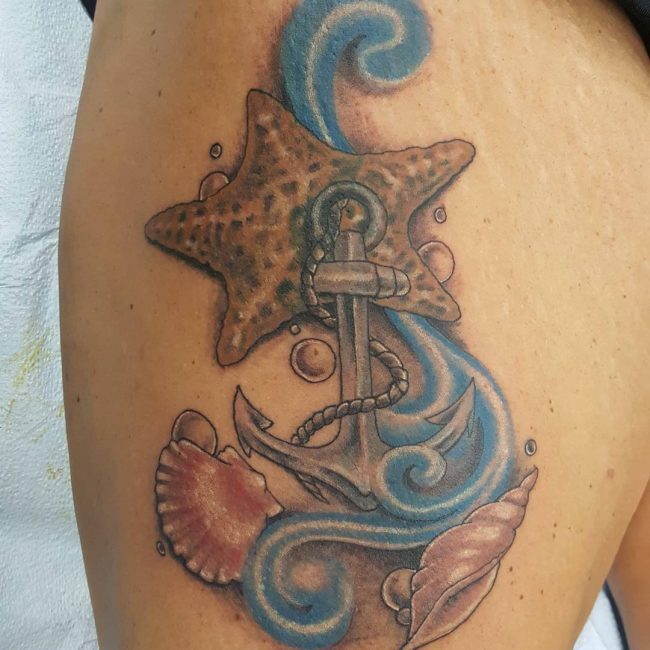 The starfish is also very symbolic, and people believe that it represents sanctuary and salvation for seafarers in the troubled waters. 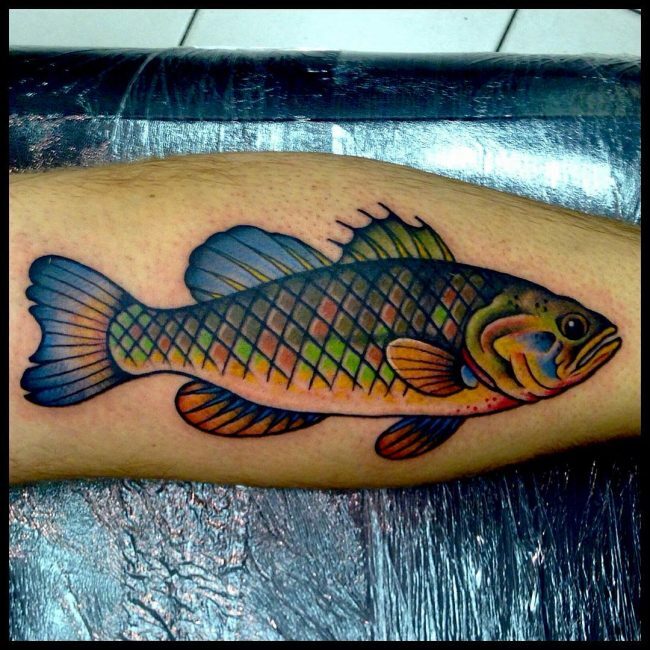 A fish tattoo does not always have to represent an actual fish or something that exists in nature. 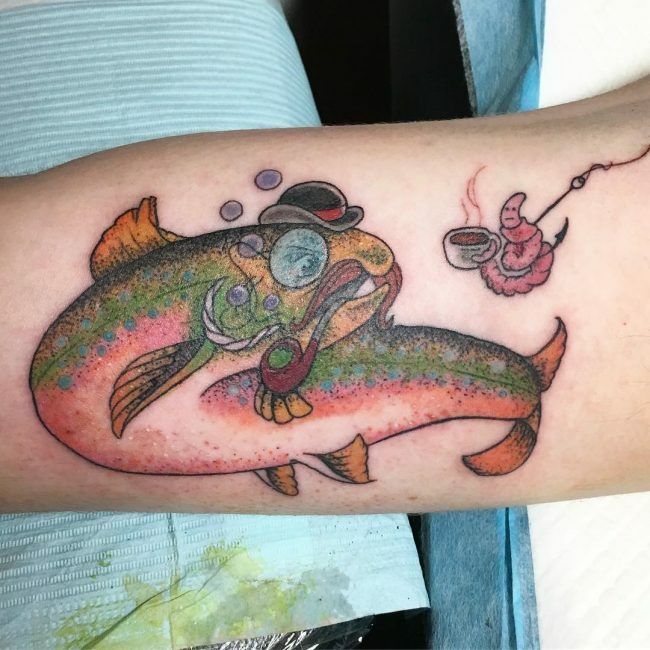 You can spice up your fish totem with some color to create an excellent design, and for this, watercolors are the best choice. 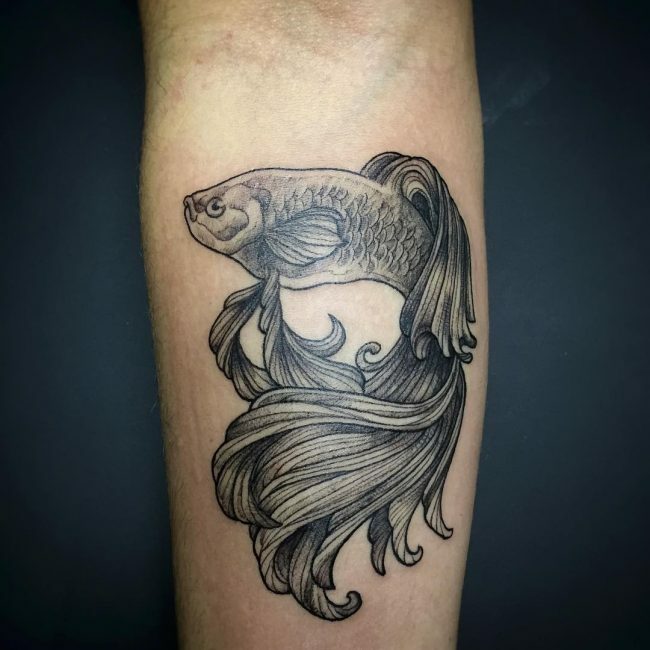 It is also a good idea to draw your fish as an animation or cartoon. 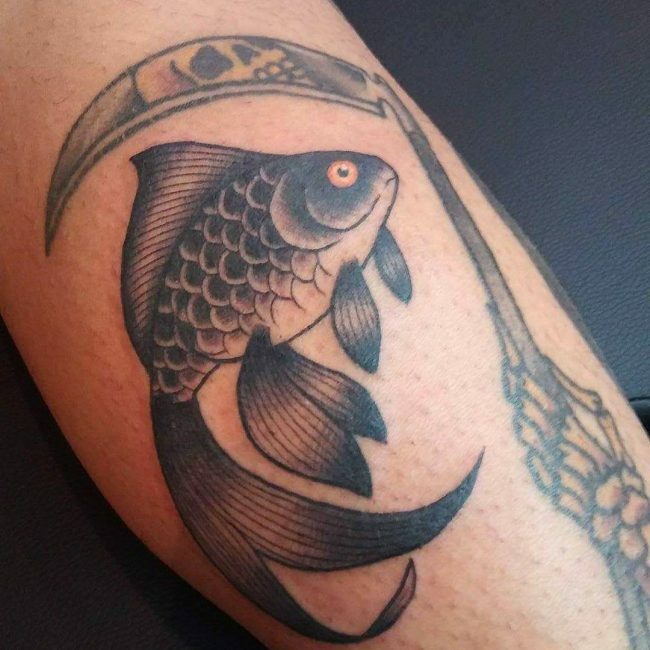 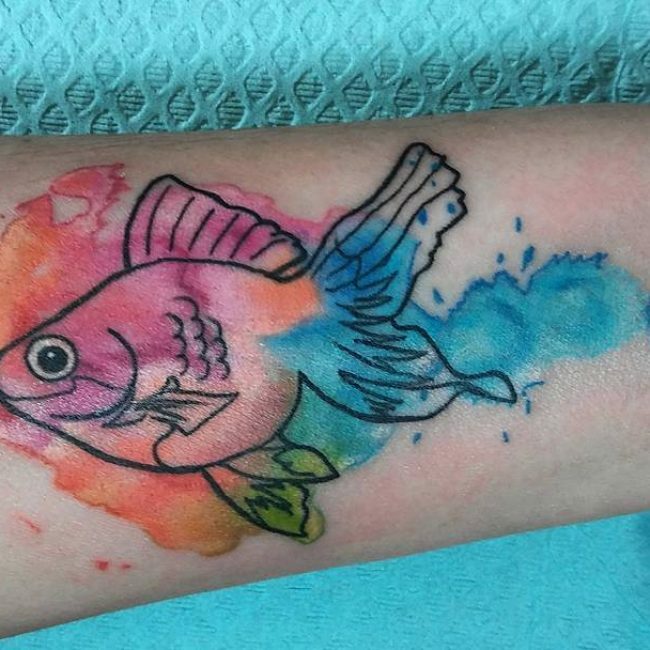 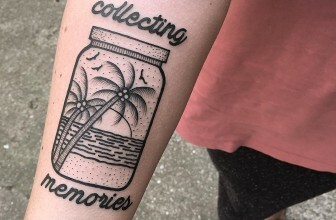 Animations might not be an image of a real life fish, but they still make beautiful tattoos. 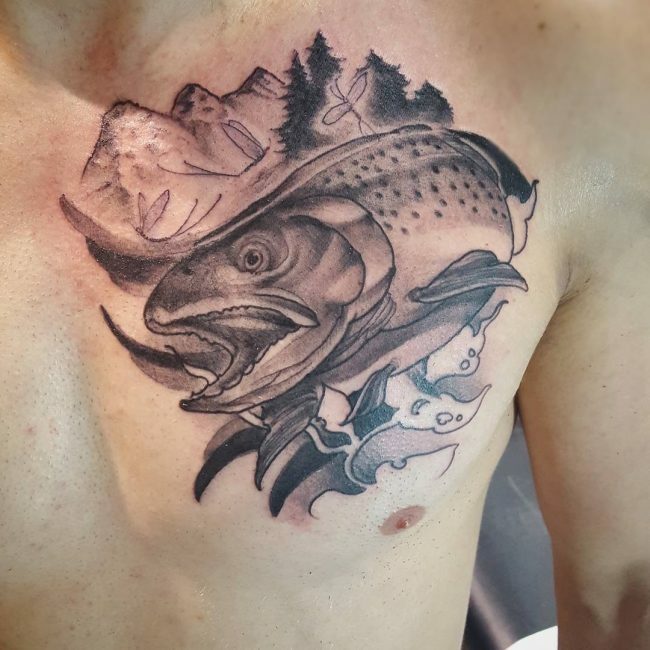 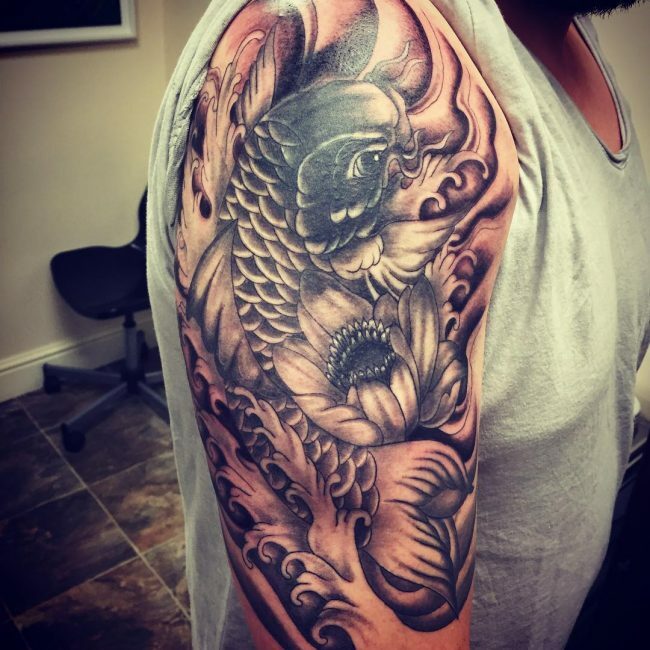 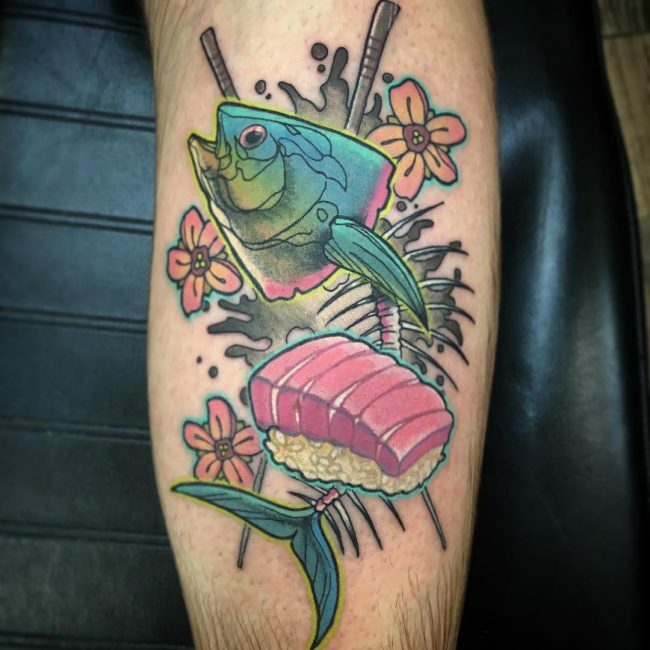 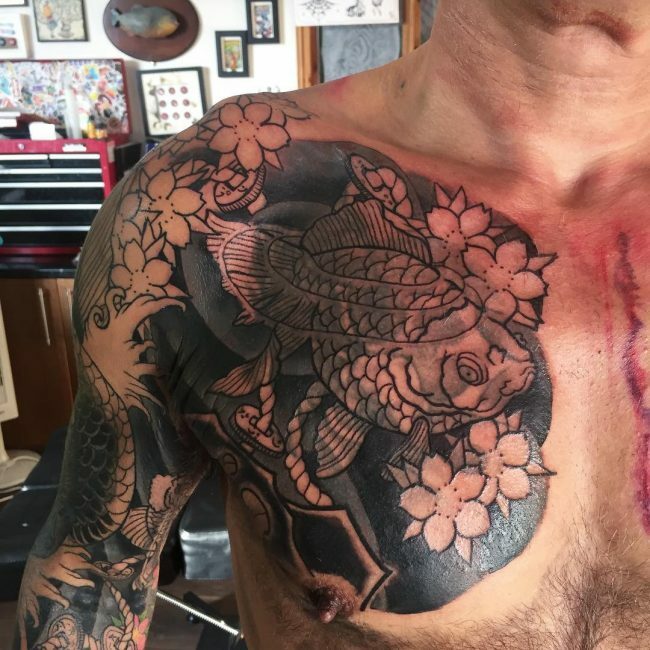 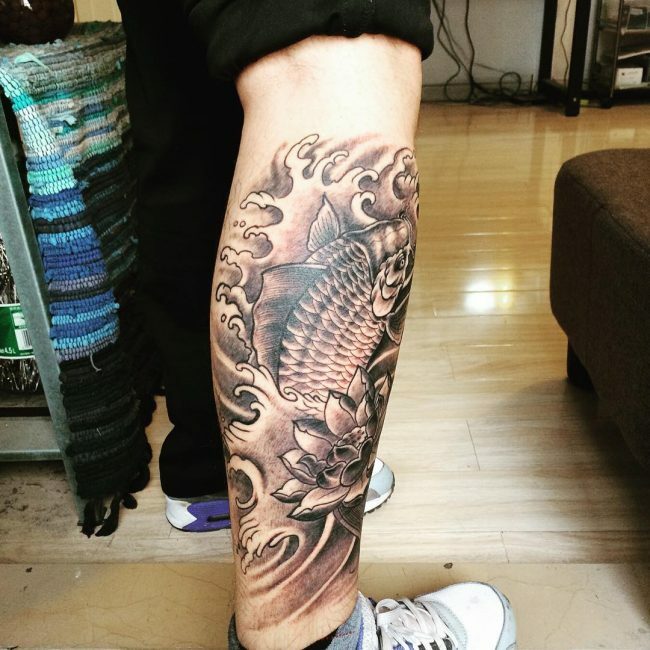 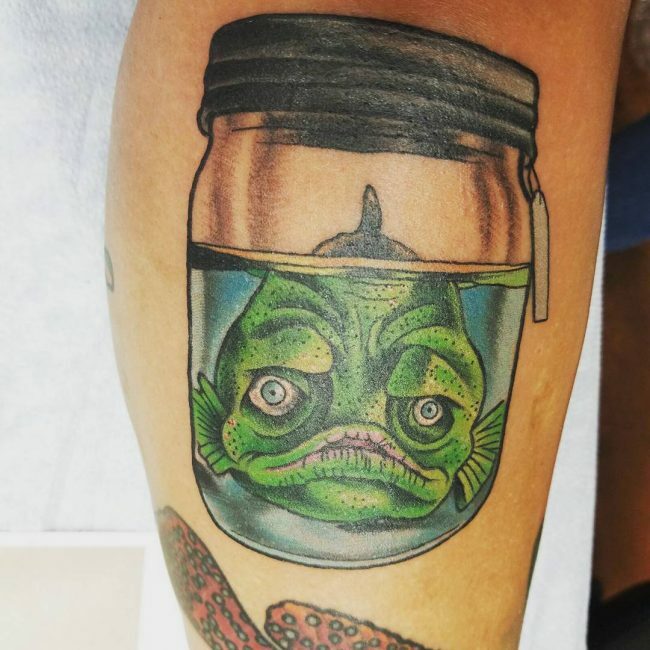 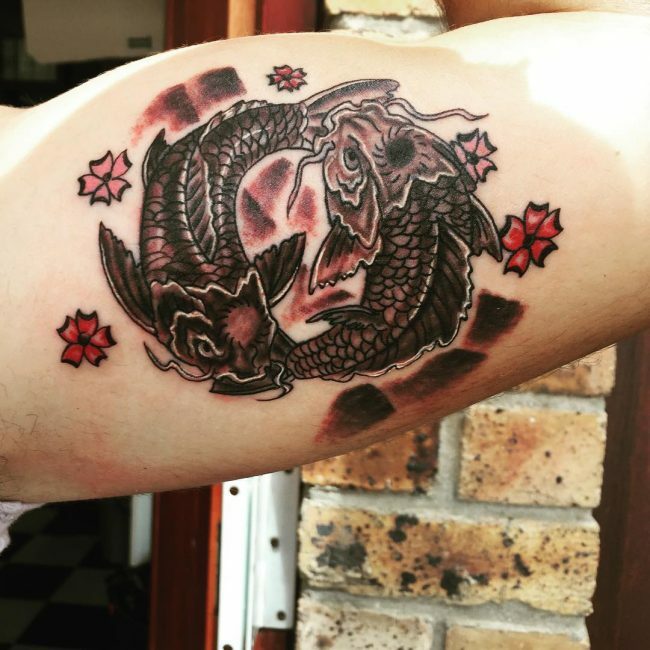 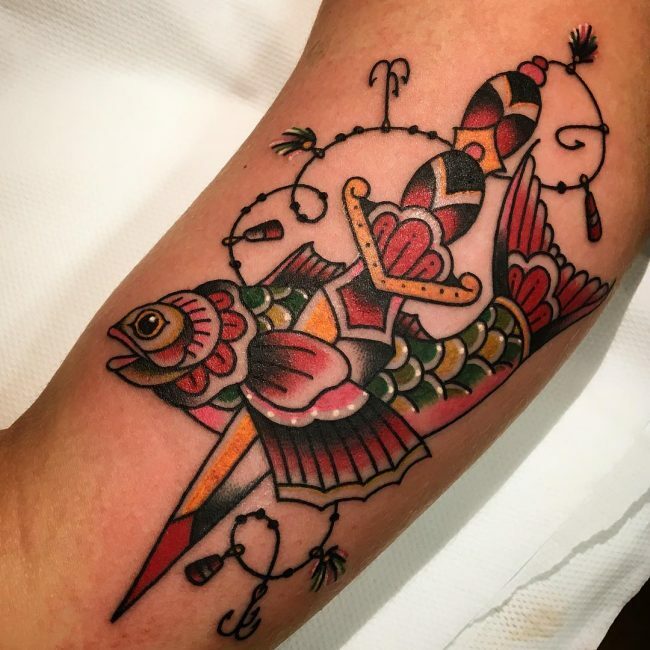 Where you choose to draw your fish tattoo will have a significant effect on how it will look and so it is important to choose the placement area keenly. 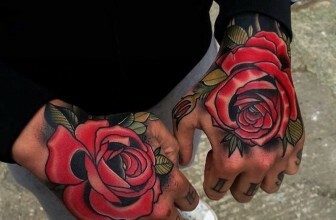 But, the best thing is that these types of tattoos will look good almost on all parts of the body. 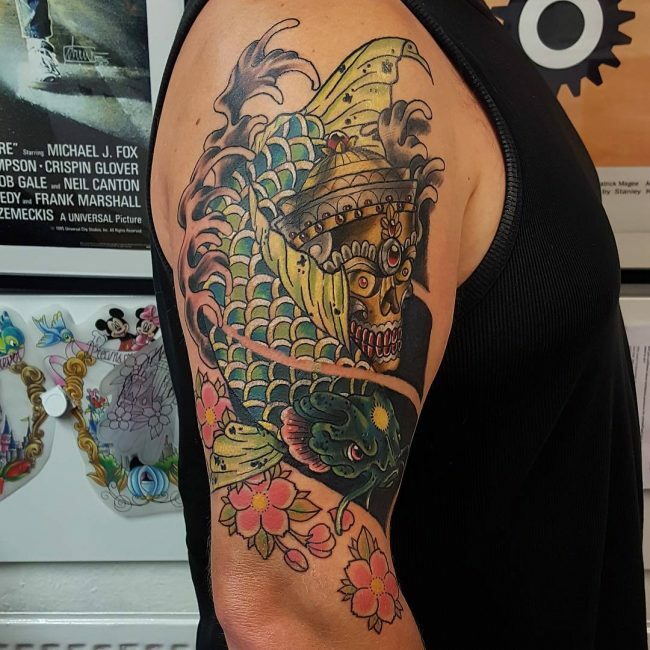 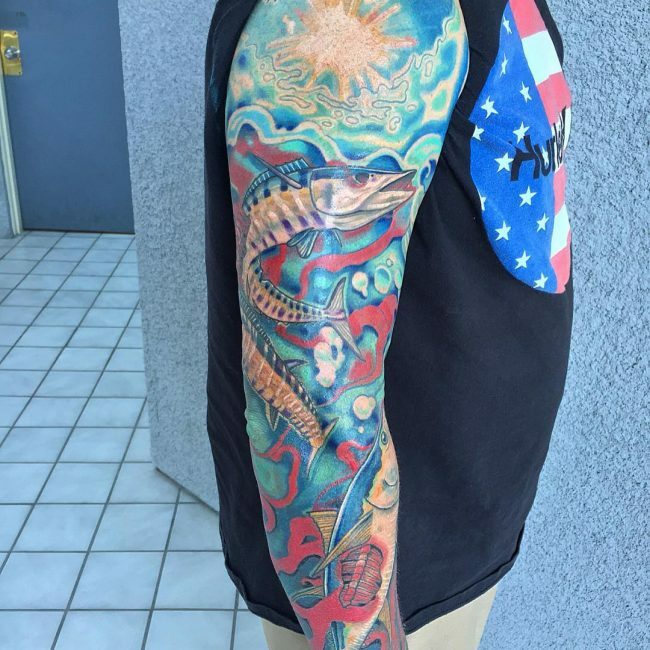 Men like to have a fish themed sleeve that entails drawing one or more fishes swimming in the ocean or having a massive koi fish as a sleeve tattoo. 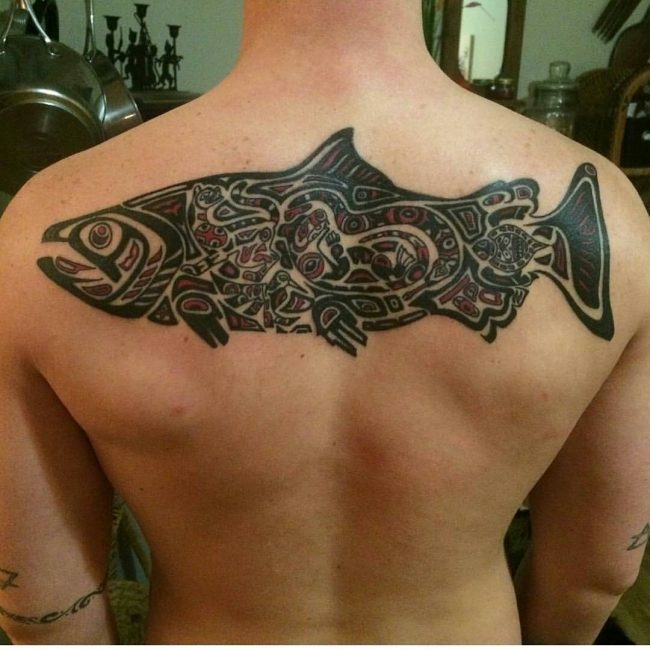 The back is also a perfect place to have your huge fish totem because there is more than enough space. 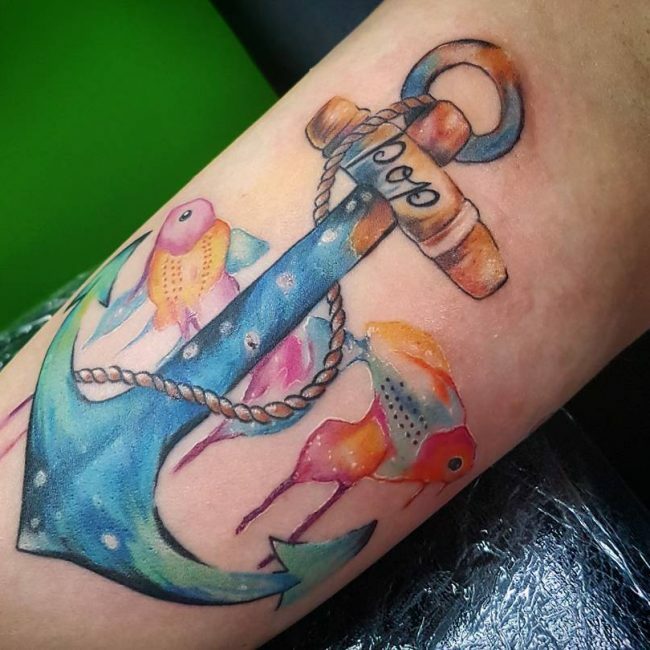 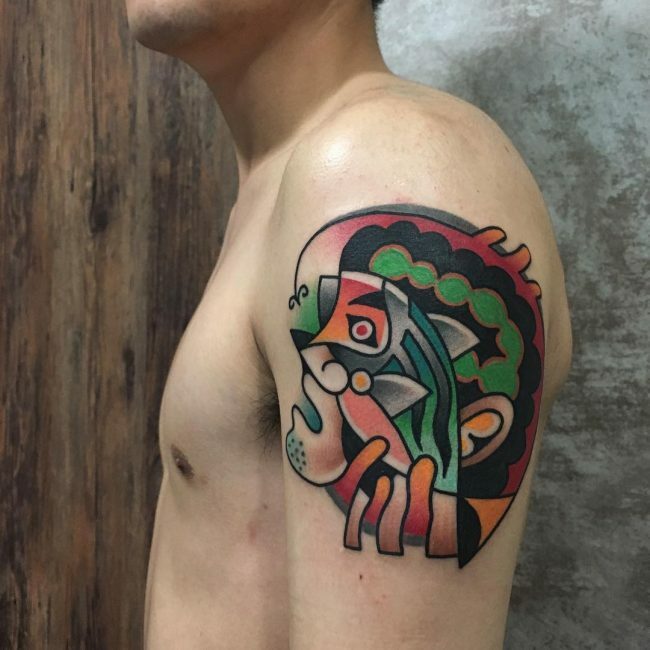 But, if you want your tattoo to look unique you should have it in places like the ankle, upper arm, chest, rib cage and even on the thigh. 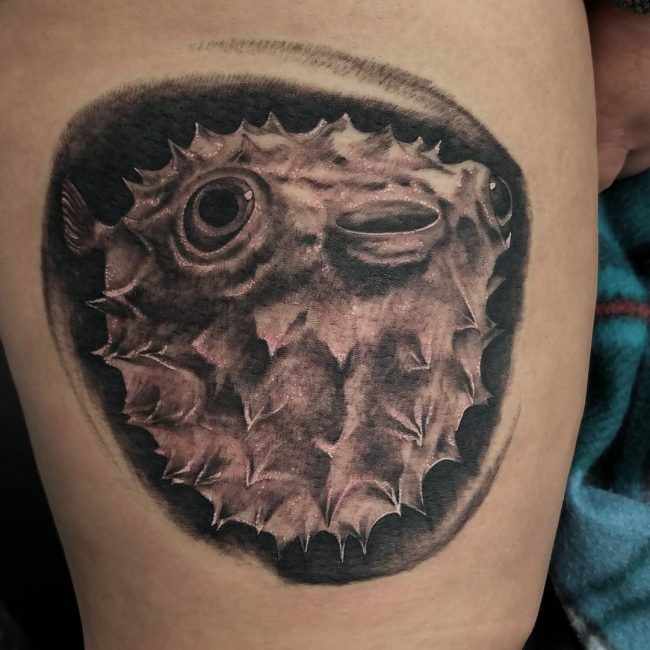 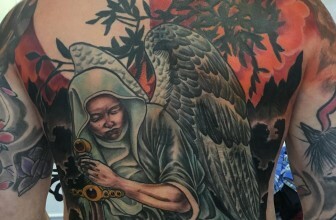 All in all, it is important to consult your artist on the best placement area for the unique tattoo that you want to get. 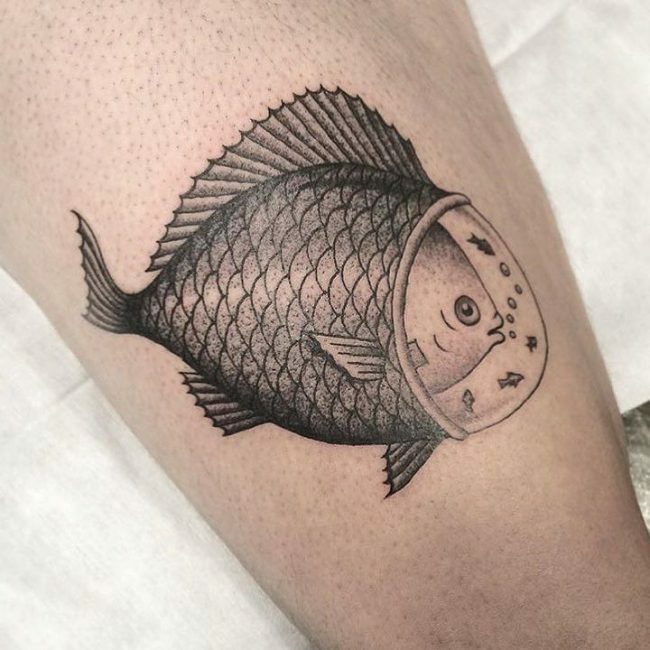 The fish tattoo is glamorous but it is also very symbolic, and this makes it the perfect body marking for a tattoo lover. 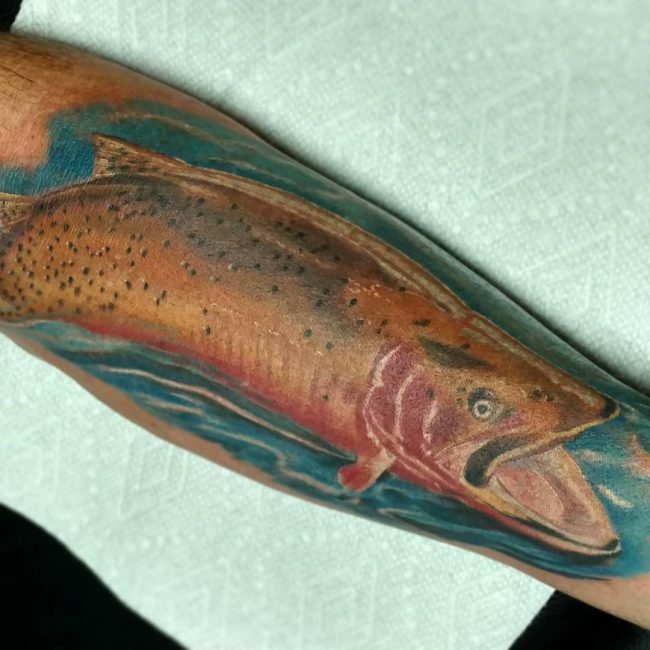 There are also many design options and types of fish to choose from and so you can always be confident of something distinct that conforms to your tastes and preferences. 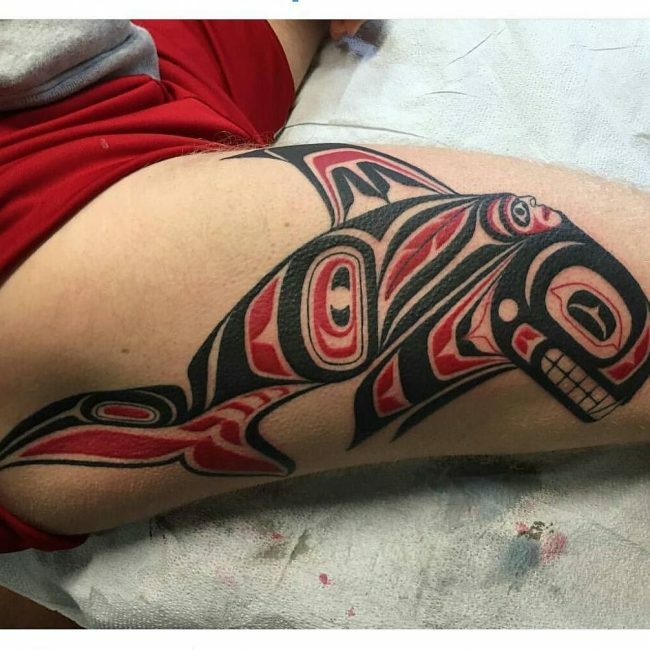 Also, think about what you want your tattoo to represent and then use a professional artist to draw it.